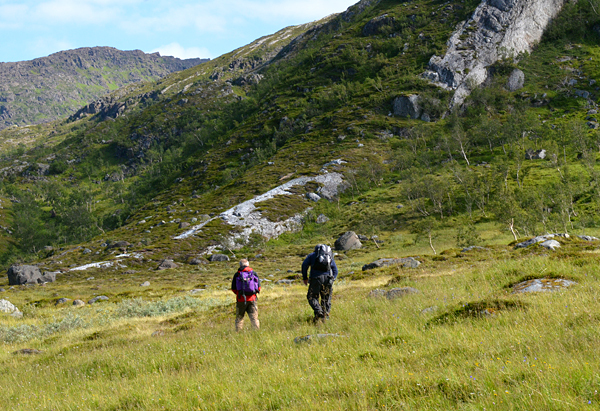 Just after the Madan trip (see report here) and Crystal Days in Lwówek Śląski we set off in the new direction - northern Norway – to Alta, over 400 km north from the polar circle! 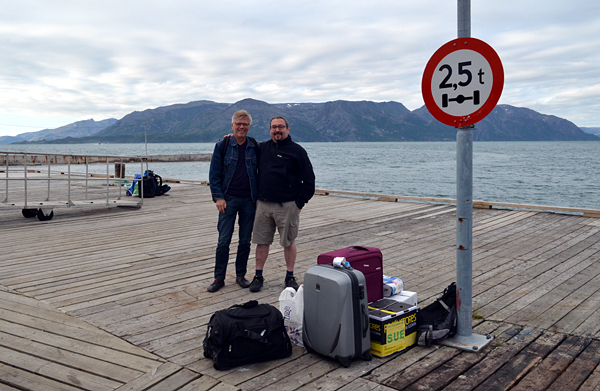 This time we travelled with our friend Jan Erik Larsen, Norwegian collector. 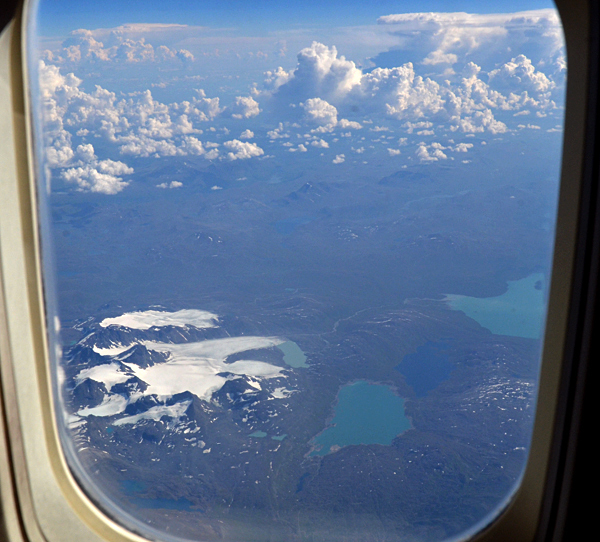 We flew through Oslo to Alta. 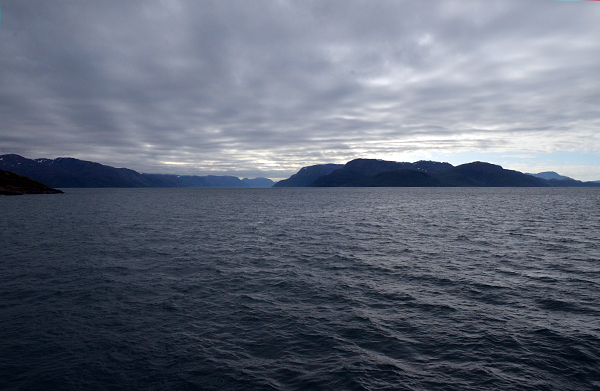 We expected cold, windy and rainy weather so after arrival we were surprised – it wasn’t too bad. In next days it was even surprisingly good. What is worth noticing, there is daylight for 24h during summer in that part of the world, so one can sunbathe in the middle of the night. 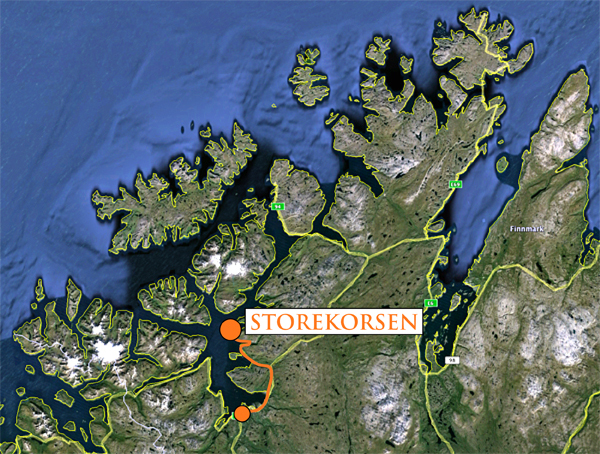 Next day after arrival we drove along the coast to get to a small ferry in Storekorsen. Road was winding and surrounded by beautiful landscapes. 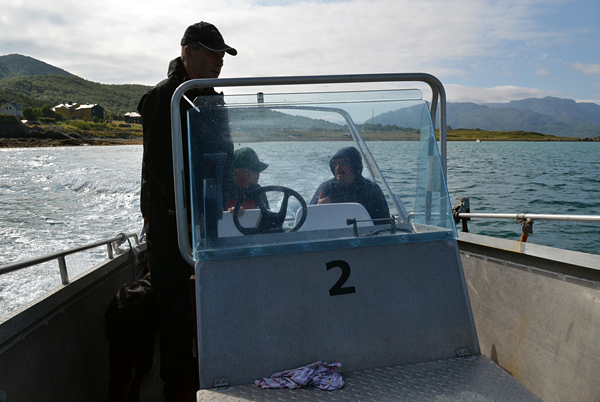 We didn`t wait long for the boat and soon started our Seiland adventure! 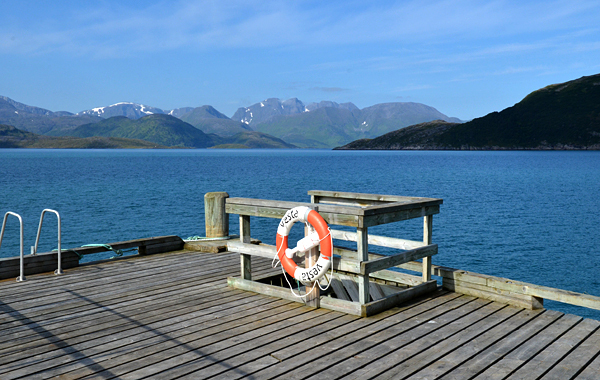 Island was visible from the harbor. 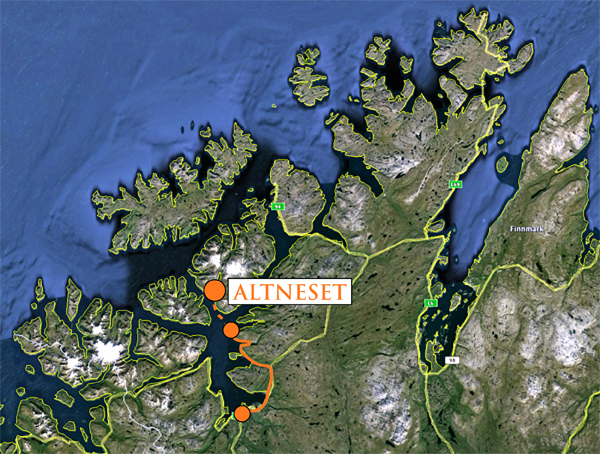 After short travel we arrived to the village which was our destination – Altneset. 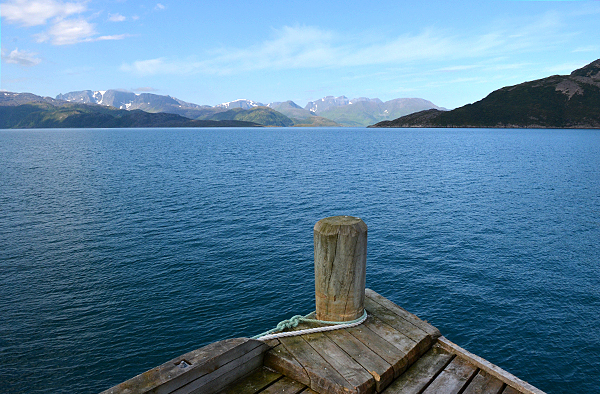 When the ferry left us on the small pier, we realized that the whole village was just a few houses. 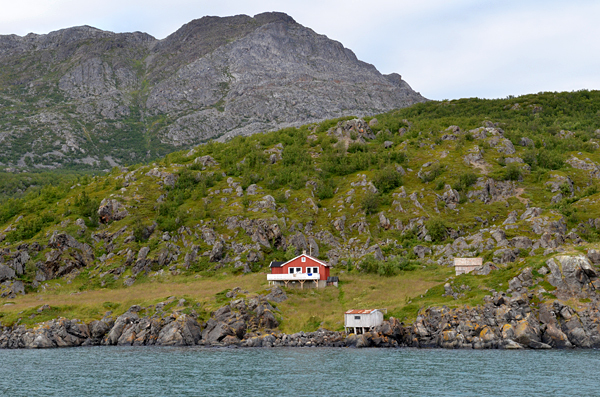 Later that day it turned up that there is only 5 people living in this part of island for the whole year! From the harbor we walked to the cottage we rented for the next days. 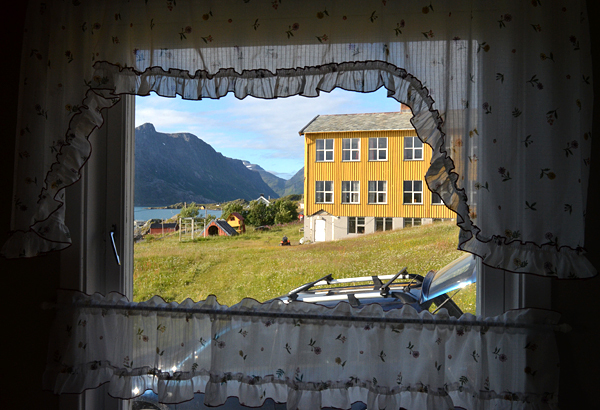 Traditional Norwegian house, good simple style and beautiful view through the windows to the sea and mountains. After “checking in” we went to meet Gunnar, local collector who owns a private museum. 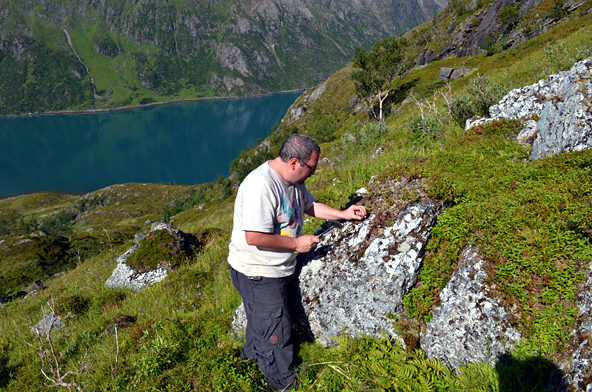 Gunnar was lucky to collect zircons on the island when they were quite easily accessible. 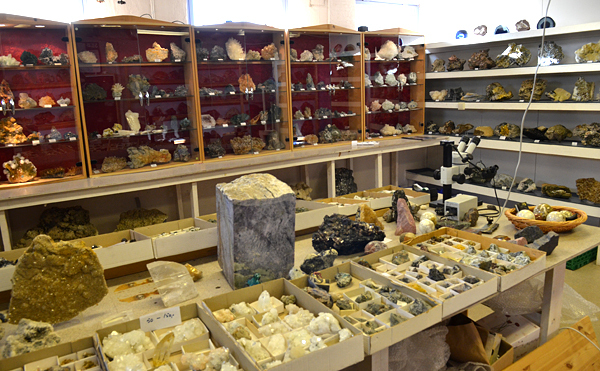 He travelled at the time to other countries and to mineral shows building his collection. Museum is located in the basement of an old school and is amazing for several reasons. 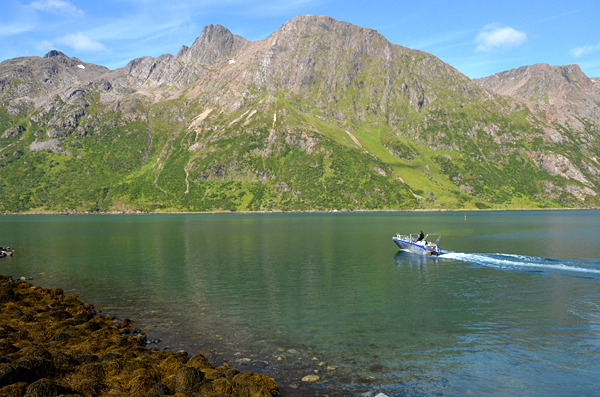 Almost the only visitors on the island are fishermen trying to catch big fish. So unfortunately only a few people come there every year. 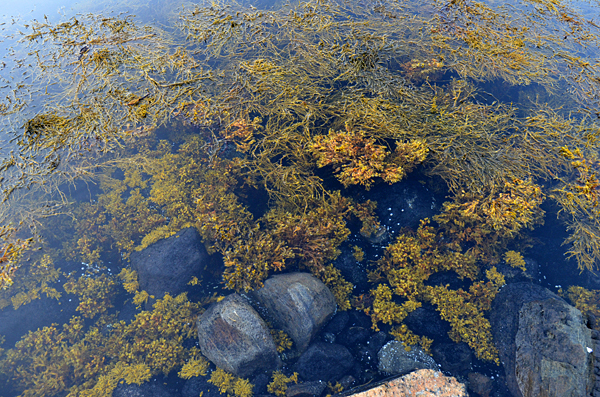 Collection itself is focused on Malmberget, Sweden specimens and of course Seiland ones. 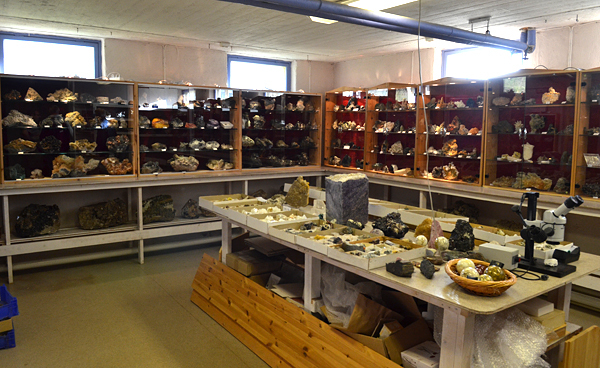 Beside of that, there is a lot of world-wide specimens, usually medium quality. 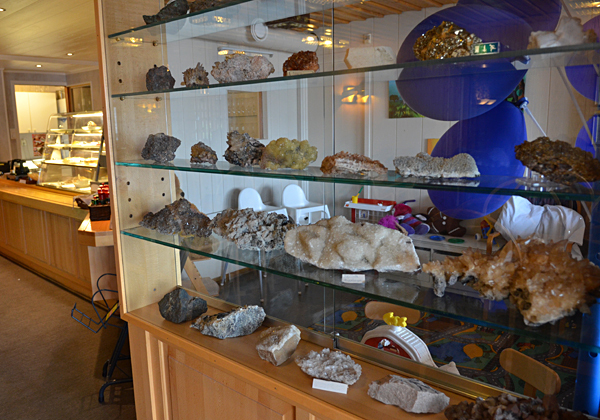 Malmberget pieces are represented by some spectacular calcites, including golden ones, butterfly twins, green fluorites, apatites and many other species. Of course the biggest highlight of the collection are Seiland specimens. Before we get to zircons it is worth noticing fairly big number of specimens from other localities in the island, such as green diopside, interesting pseudomorphs, calcites, magnetites etc. 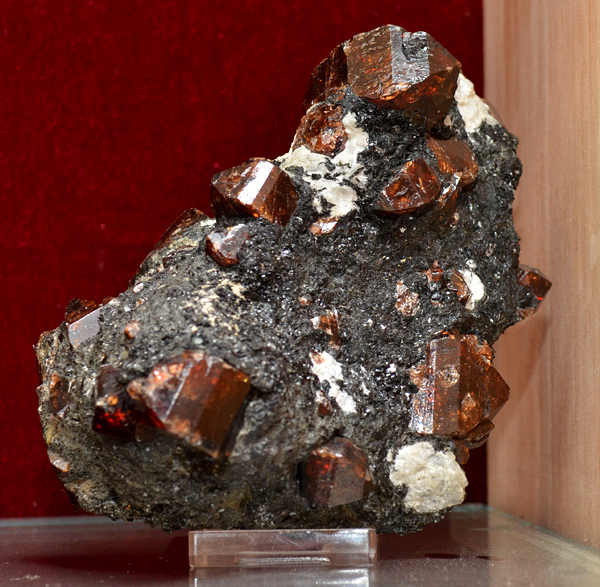 Zircons are widely represented by all kinds of speicmens, from single crystals to the big blocks with many crystals. Some of them are really huge and reach up to 7 cm! The best ones are very sharp, red and gemmy! 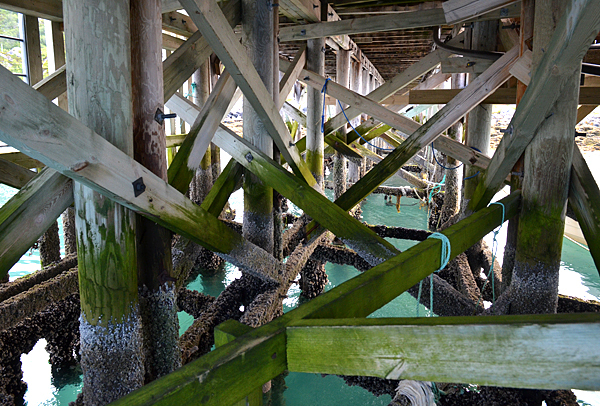 Looking at them you can easily imagine how productive this locality was in the 80’s. 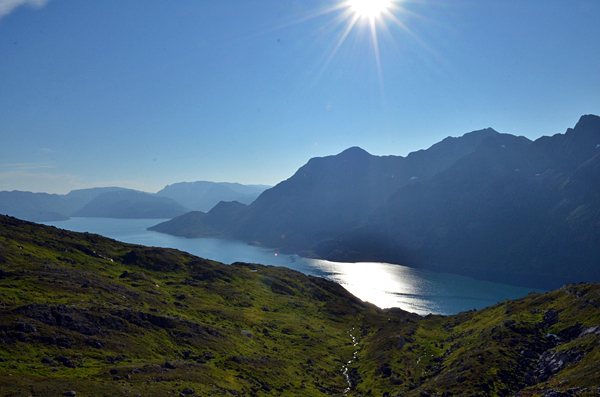 After visit in the museum we took a night walk in the sunshine – sky was clear, sun was lighting up the mountains - very interesting experience. 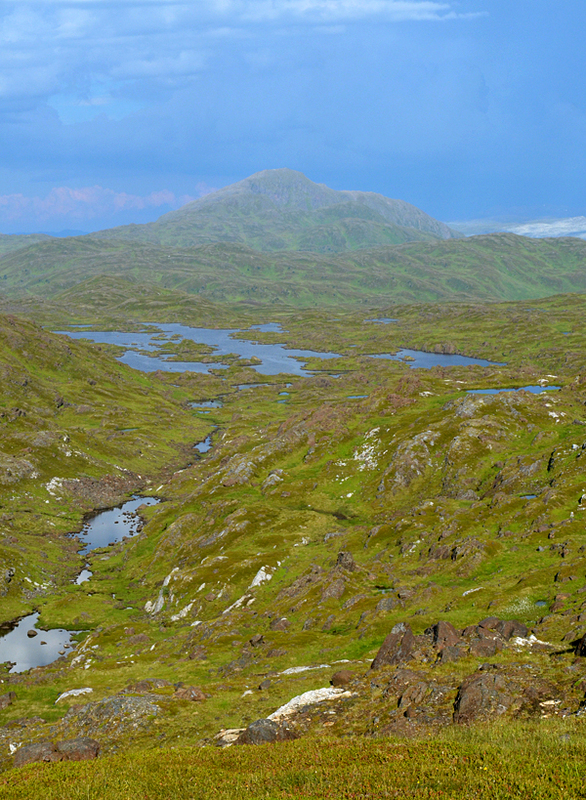 We walked along the only existing road on this part of island watching spectacular landscapes. 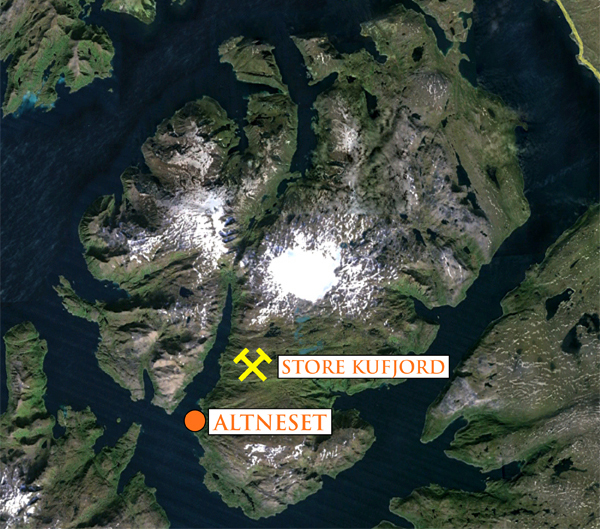 Finally we climbed on a small hill from which we could see the goal of our travel – syenite veins of Store Kufjord. 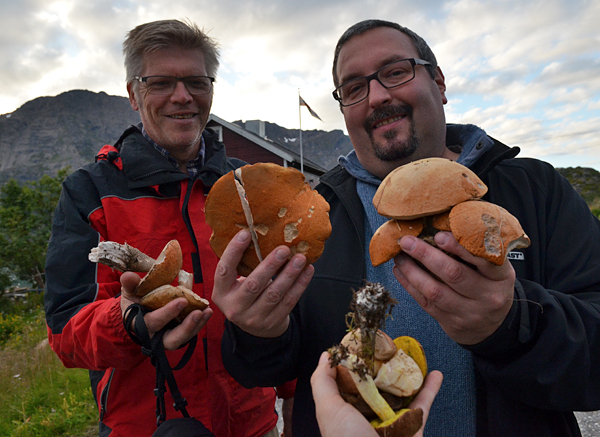 On the way back we picked mushrooms that grew everywhere! 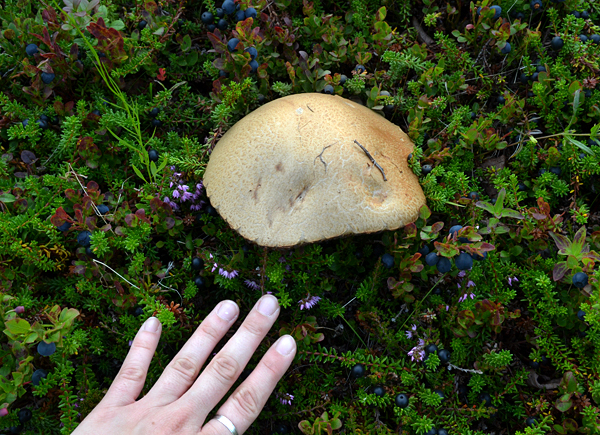 There is no tradition of mushrooming in Norway so picking them is extremely easy. 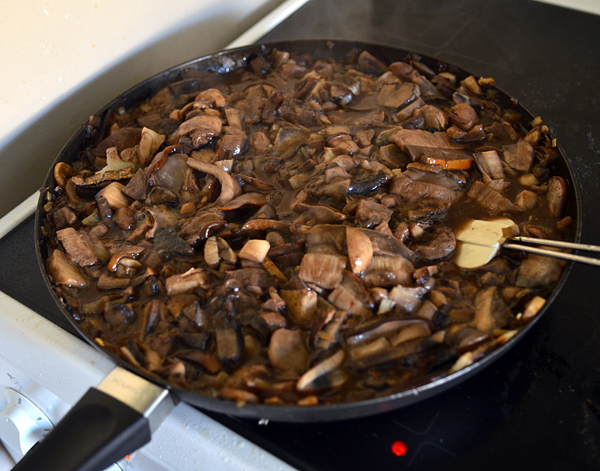 This evening we had a lot of stewed mushrooms! 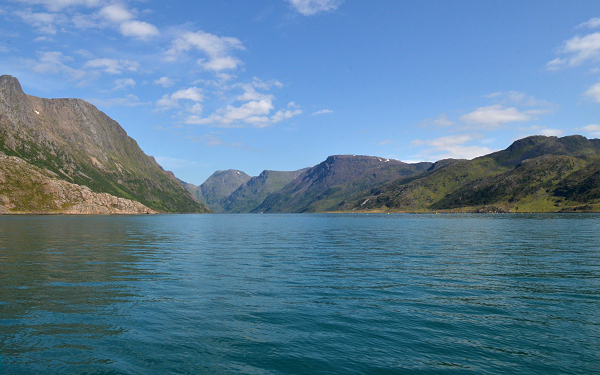 Next day we took a boat to get to the fiord. Again landscapes were breathtaking. 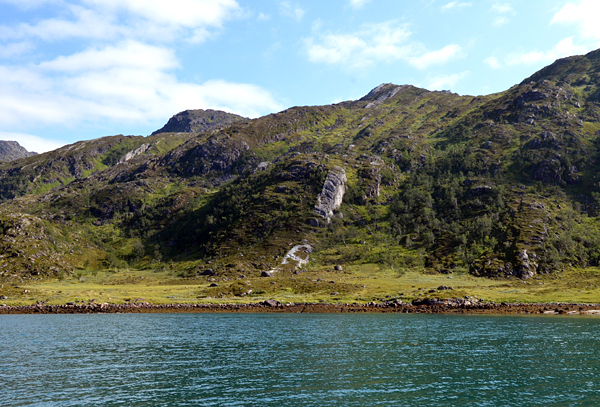 Soon we were close to the numerous huge veins which stretch out from the sea to the top of the mountains – about 800 meters above the sea level. 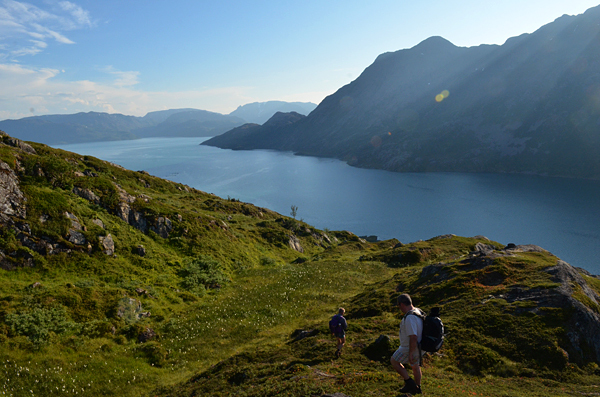 Main locality, Store Kufjord, is located exactly on the top, so we had to climb up a steep hill, without any trails or paths. When boat left us on the shore we started our way up. Of course first we went to take a closer look at the syenite veins – they were really big, several meters wide, a few kilometers long. 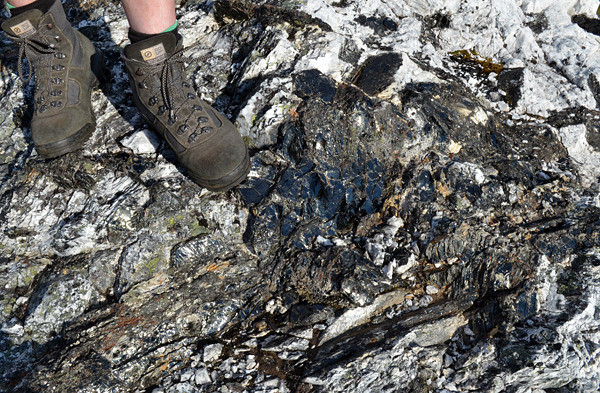 Many huge feldspar, biotite and magnetite crystals were visible in many places. No traces of zircons unfortunately. 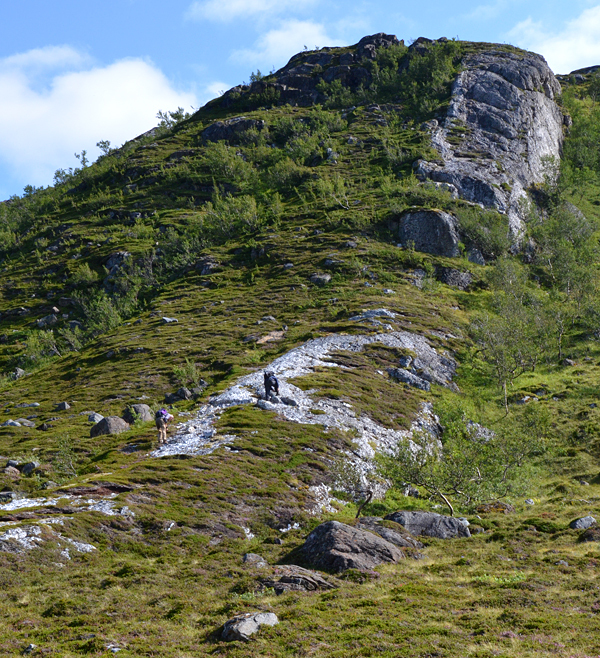 Climbing up through the rocks, bushes, moss, small rivers etc. was exhausting and took us some time. The higher we climbed the more beautiful view stretched our in front of our eyes - wider panorama with every few meters. 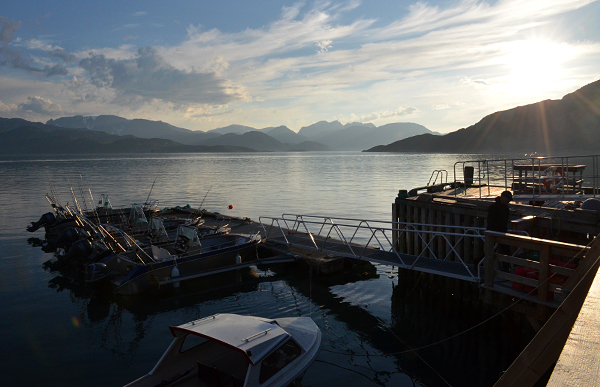 Finally we had a view to the whole fiord, mountains and islands in the area – really beautiful. 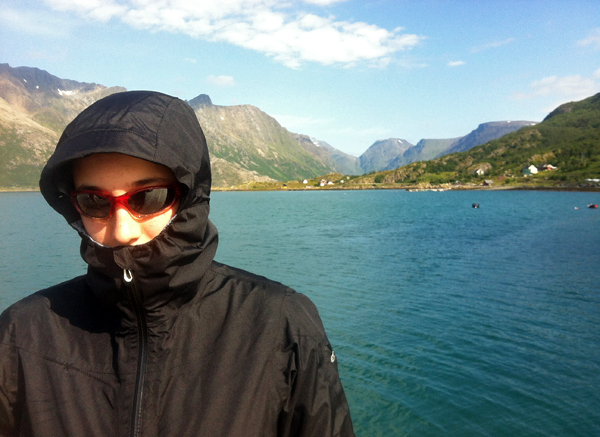 That day we were prepared for a strong wind, cold and rain. 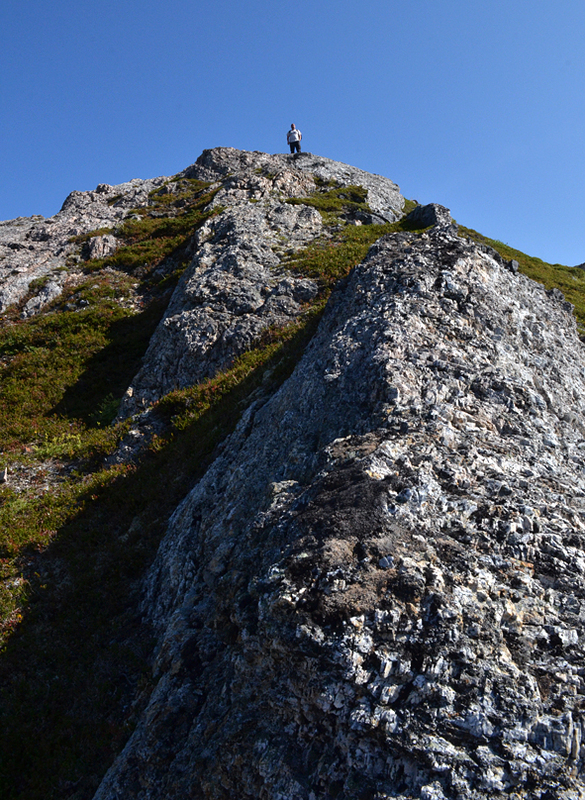 We were surprised when we realized when climbing that we were sweeting, and it was really hot! It was cloudless, no wind, and temperature was 26C! Soon later Asia had sunburns! 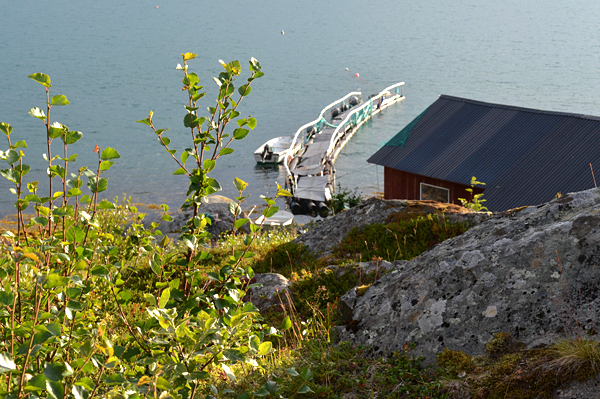 Who would expect that 400 km north from the Polar Circle? We took off and packed in backpacks more and more clothes. Finally Erik and I ended up only in the underwear, it was probably a funny view? 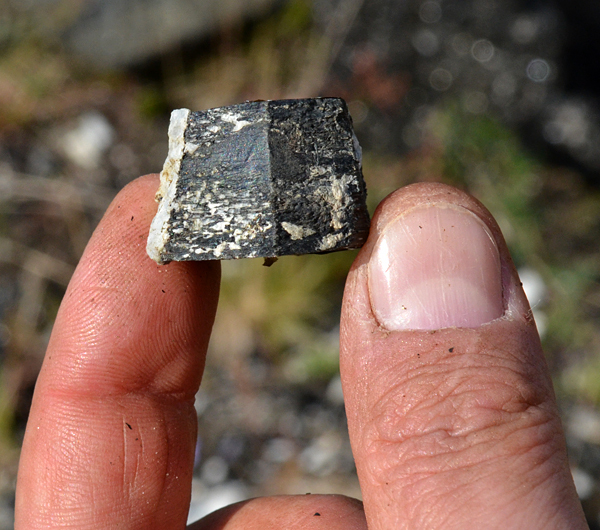 When we arrived to the biotite lens it turned out that it is rather small and heavily exploited. 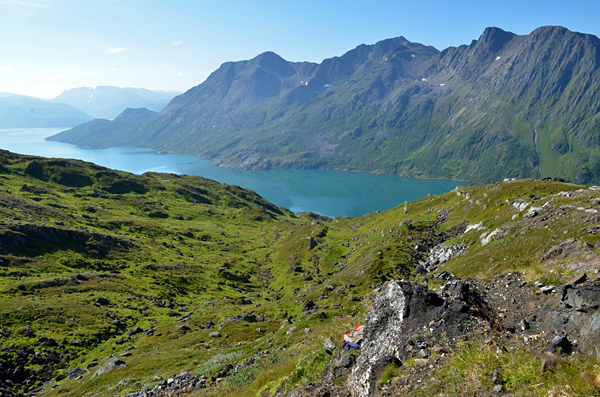 In 80’s there was a group of Norwegian collectors who camped there for two summers and made heavy works – drilling, blasting etc. 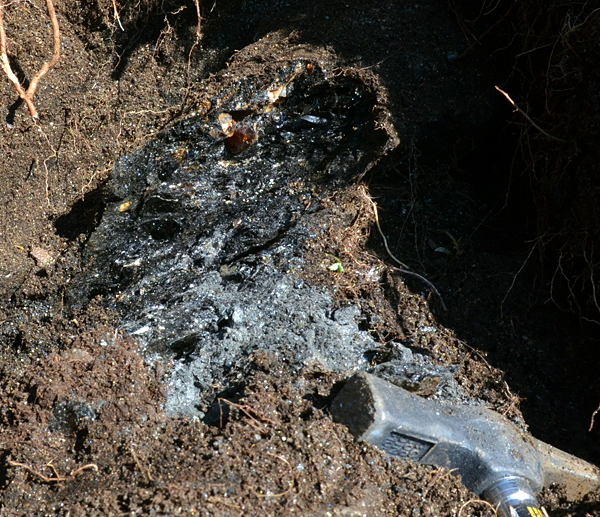 Today biotite is mostly exposed in the floor of the small workings. 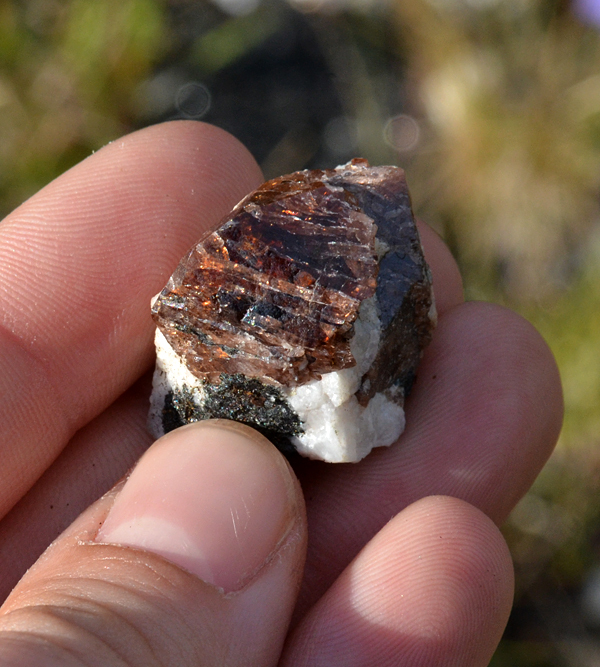 It was quite easy to find zircons on the surface as loose or broken crystals, but to get them in situ was much more difficult. 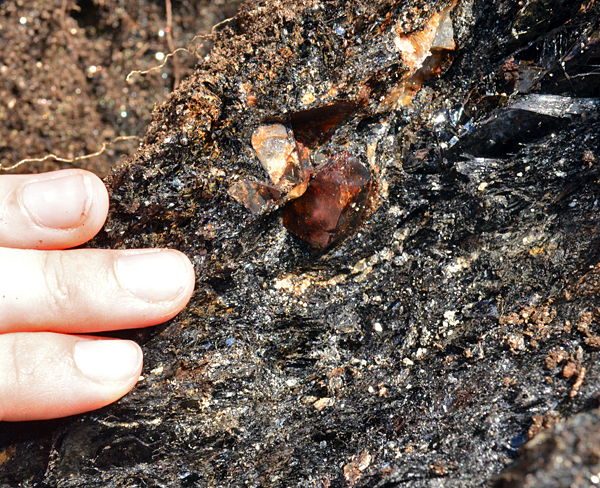 After longer digging we found zone with zircon crystals in biotite rock. 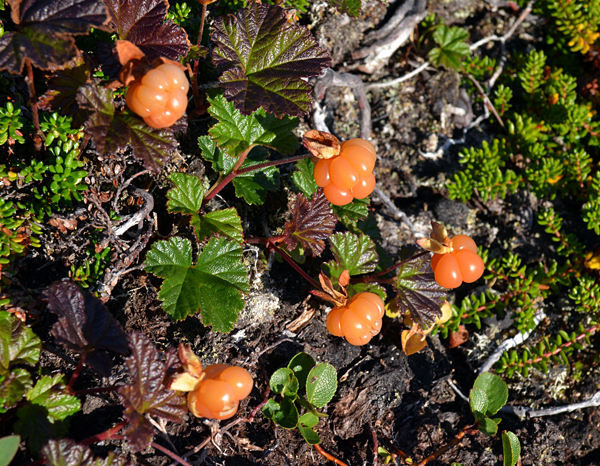 Some of them were up to 2-3 centimeters, well formed and lustrous – we were excited. 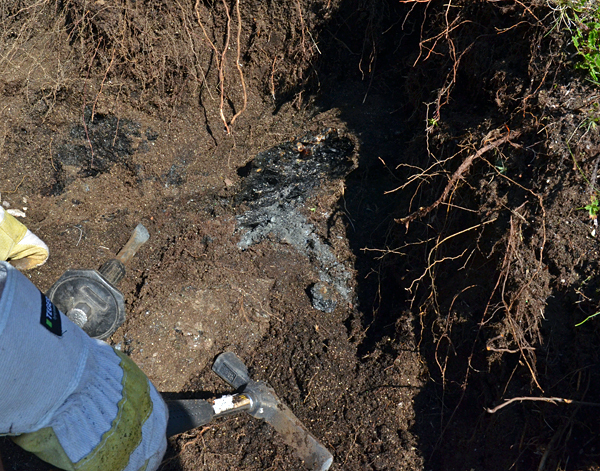 We spent another two hours trying to carefully dig them out. 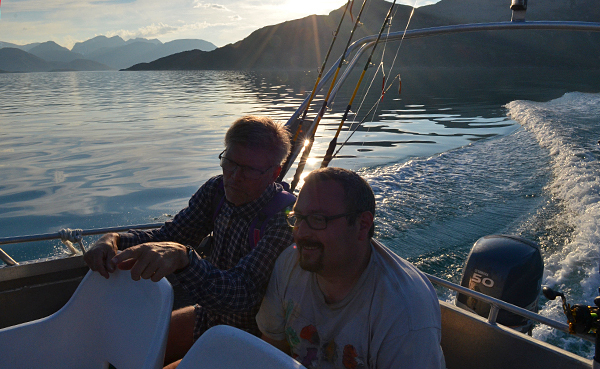 We were quite successful and at the end of the day we had around 10 good specimens and many lower quality ones. It was late but sun was still up and we decided to go to see plateau. 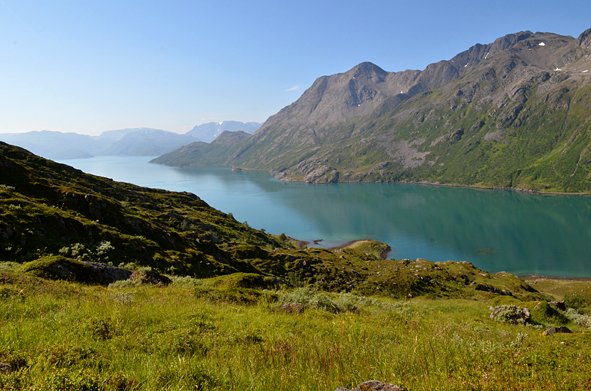 Close to the zircon workings the view opened and we could see spectacular scenery – green grass, scattered post-glacial lakes, mountains and glaciers. After taking some photos we started going back downhill. 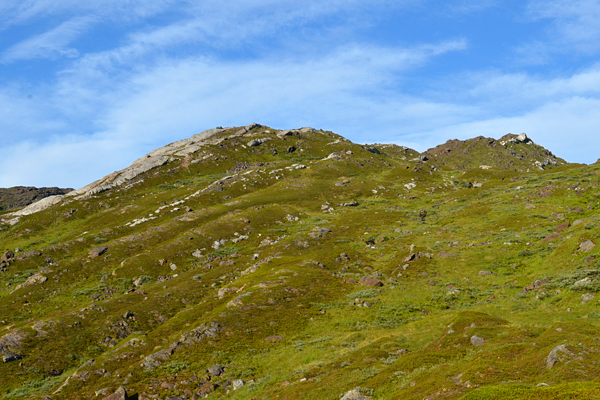 It was much easier than going up – we could plan the road seeing everything from the top. 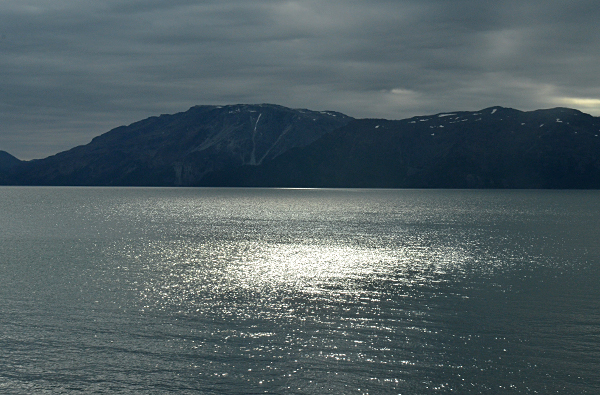 When walking down sun gave us a great spectacle – it was hiding for some time behind the highest mountain on the other side of fiord and light was forming interesting bundles. 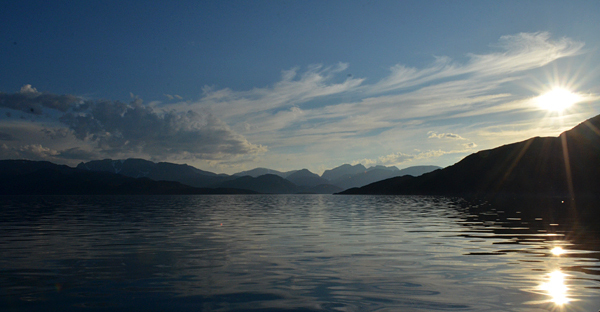 Soon later we were in the boat going back to our cottage, where after a few drinks we fall asleep. 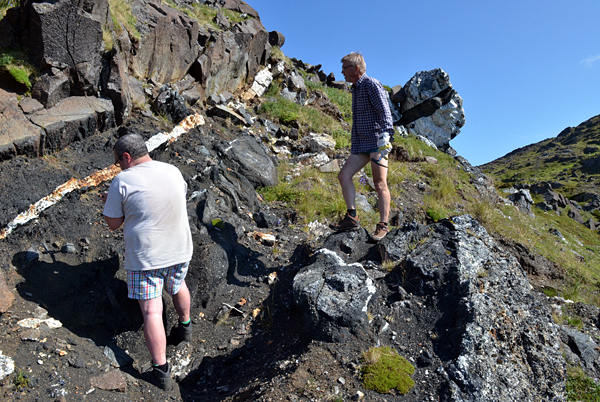 Next day we were tired and felt a lot of muscles so we decided to visit much more easily accessible syenite vein, mined years ago in small quarry, south from the village. 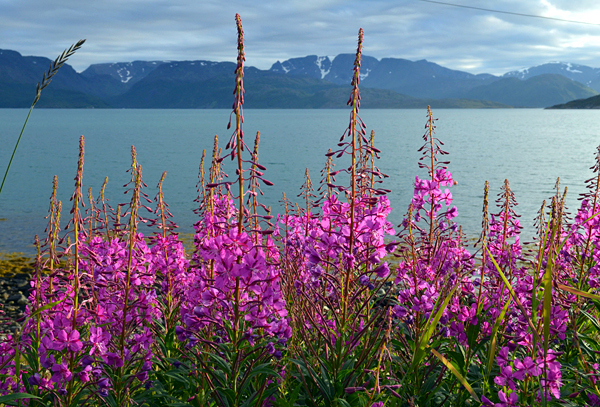 We walked along the main road admiring landscapes. 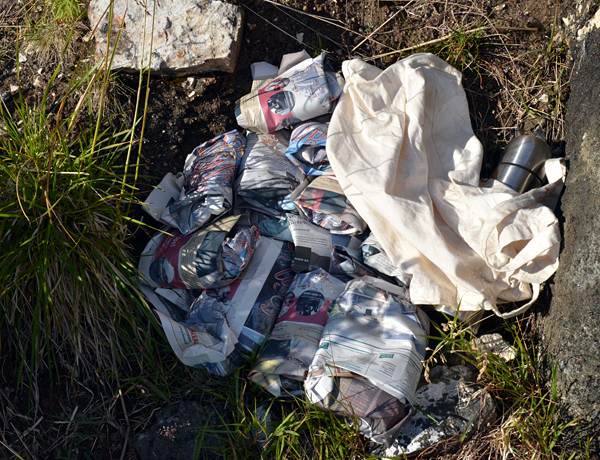 Quarry was not easy to find, hidden in the bushes, surrounded by small swamp, we finally found it. 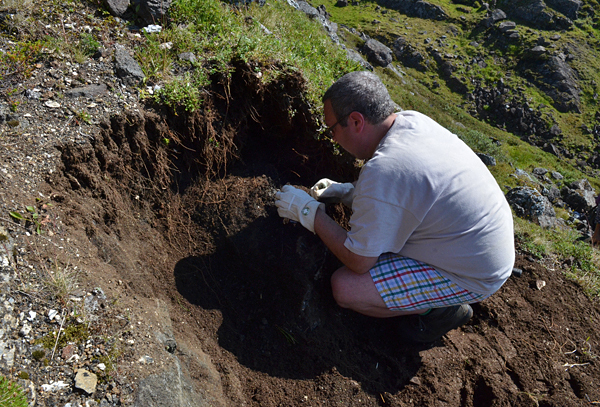 It was easy to find huge feldspar crystals, biotites up to 30 cm, but not many specimens to collect. 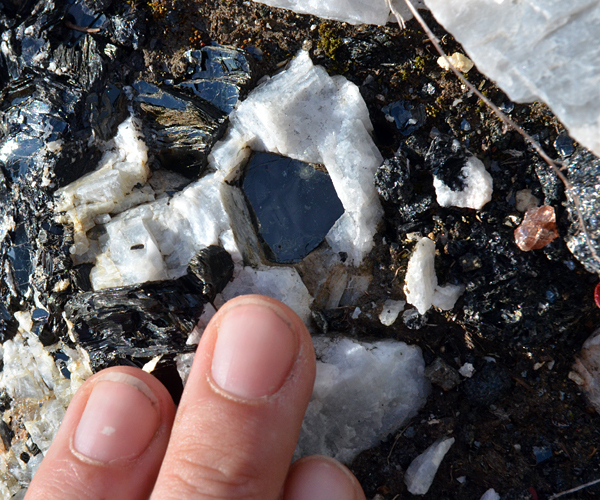 Earlier this small quarry produced some dissent diopside crystals and pseudomorphs. 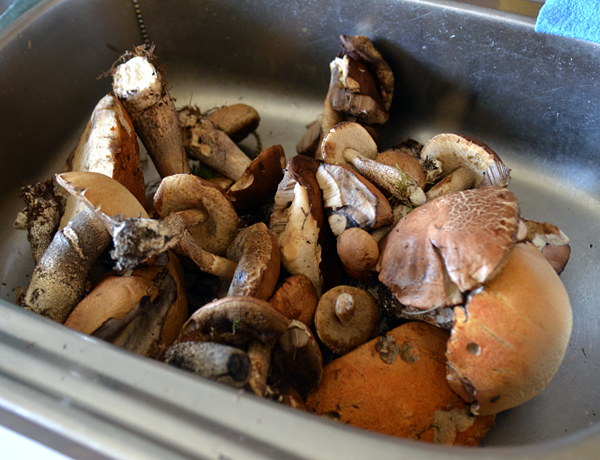 After checking out the quarry we started our way back picking many mushrooms – much easier than collecting specimens! When we came back we cooked mushrooms again. After lunch we went to visit Gunnar to see the part of his collection he keeps in the house. Again some very nice local specimens were there. 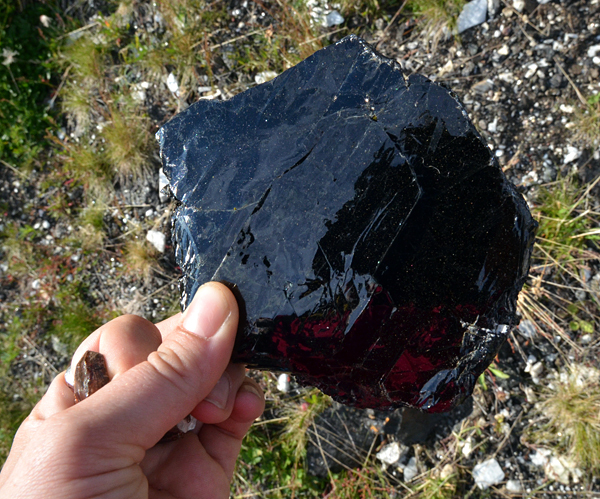 Especially worth noticing was a big crystal, looking like hexagonal prism with flat terminations, analyzed as thompsonite according to the owner (see photos) from Seiland. 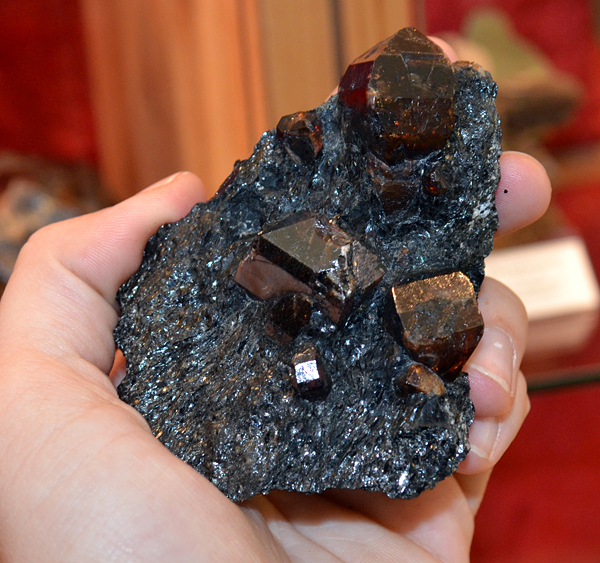 Also some very nice zircons were displayed. Next day we started “zircon adventure” for the second time. 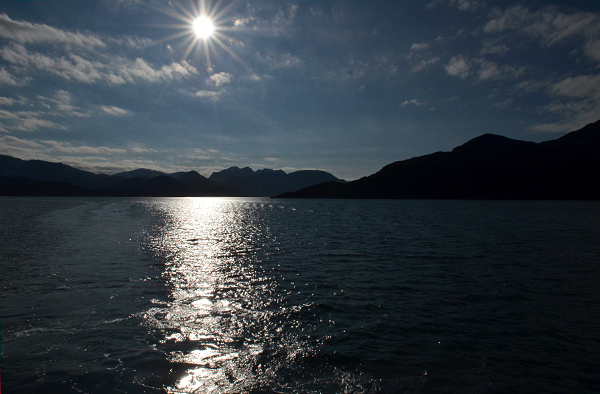 That day the sea was extremely quiet – no waves, sea table as a mirror reflected everything. 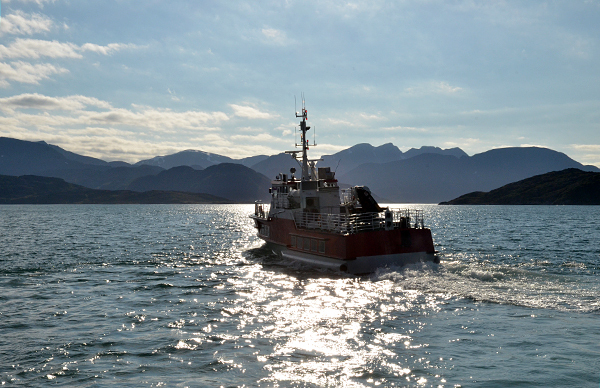 This time in the middle of the fiord our boat broke. 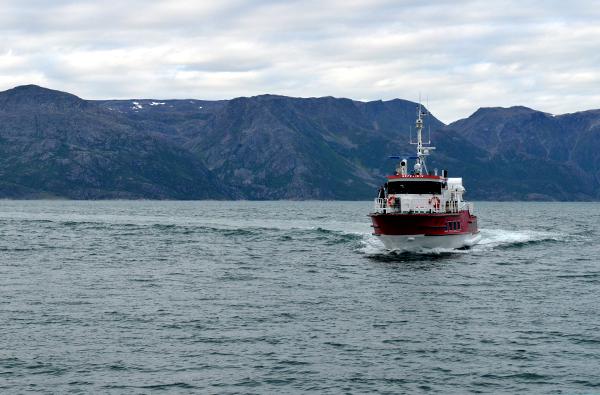 Luckily there was telephone connection and we called for rescue – soon we were on the shore where we started our exercise again. 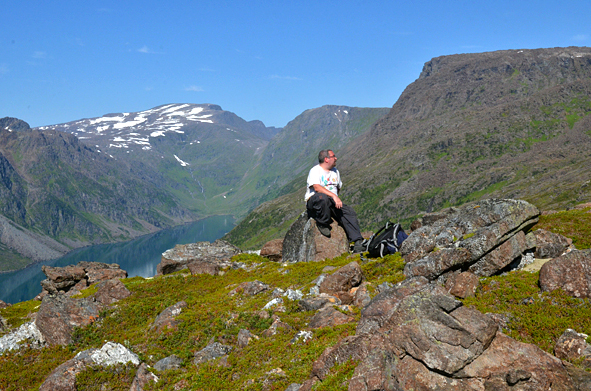 Again long climbing, spectacular views, and again very warm weather, no clouds and almost no wind – just like Morocco? This time we were clever and had much less closes. 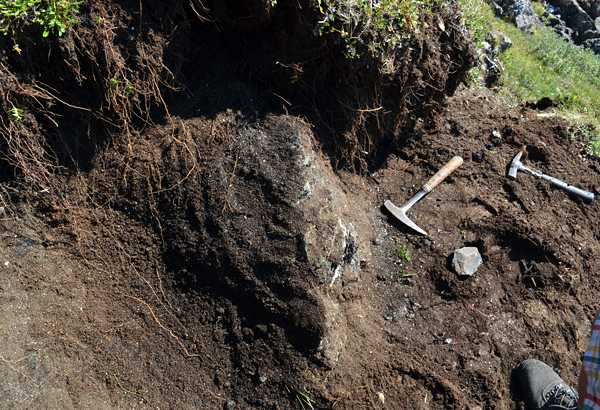 When we reached zircon zone we started to dig in other places than last time – in the big blocks where on the contact of biotite rock and syenite many small gemmy zircons occured. 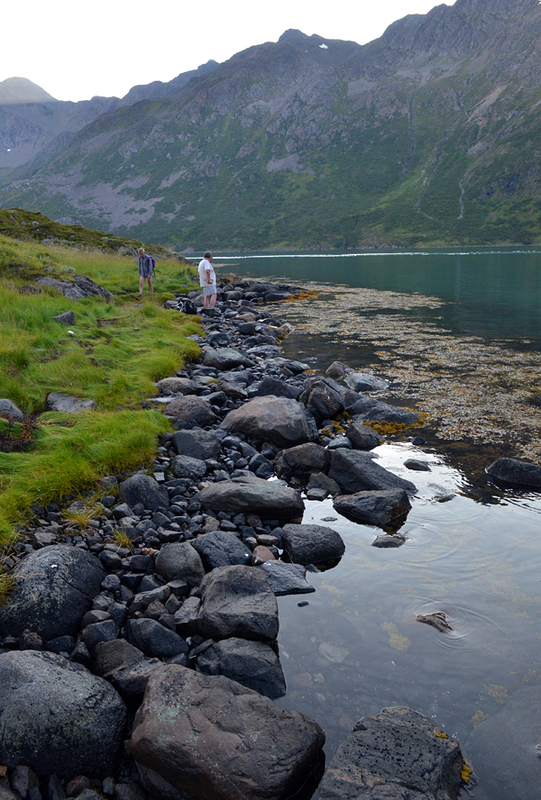 We extracted many specimens there, mostly small ones. 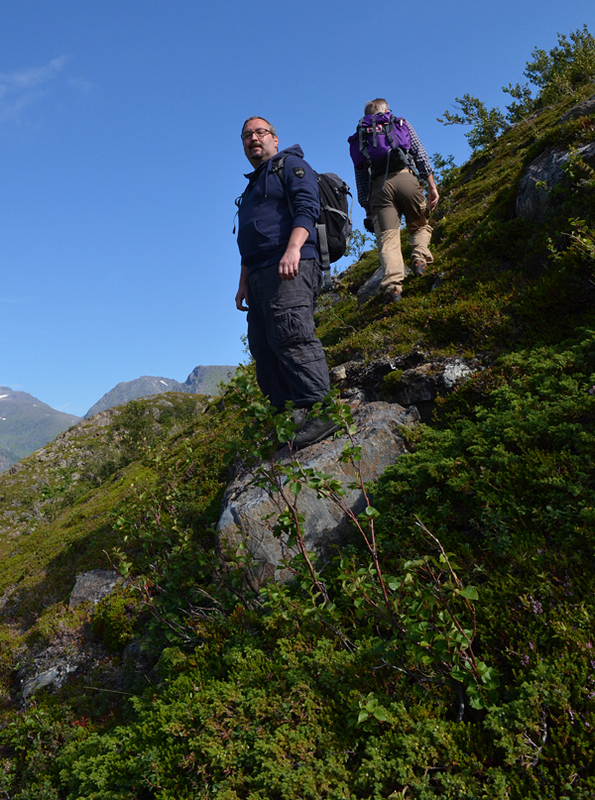 Later we checked other outcrops to get to know for the future which area is the most productive. This time with heavy backpack we went down quite quick. 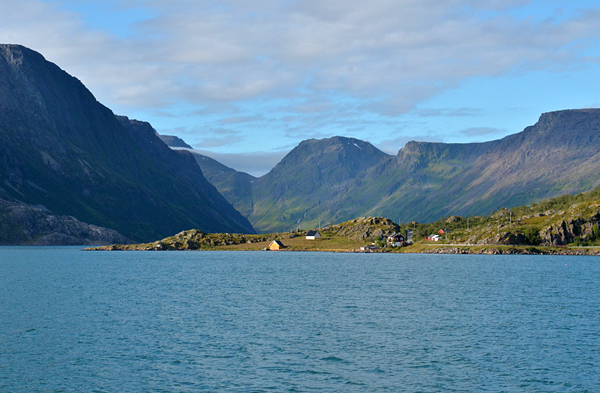 Called the boat and had last look to the fiord and locality. 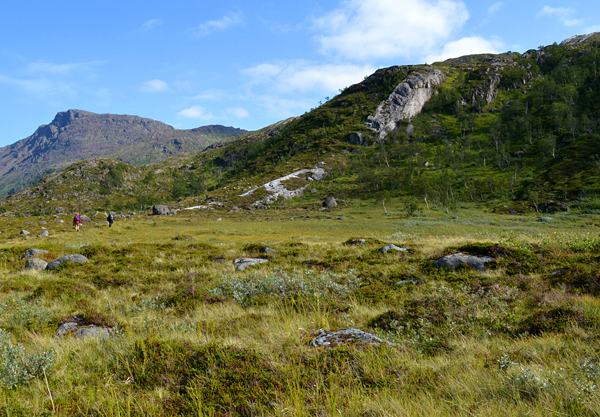 It was exciting experience to collect there and definitively this is one of the most beautiful places we have ever been collecting! That evening we had small 3 people party and the next morning we had to leave the island. 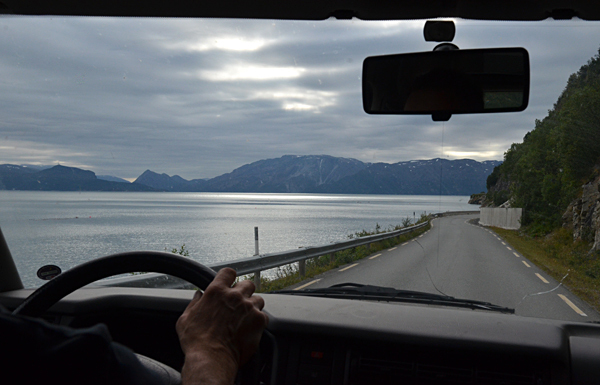 We took a ferry and drove to Alta, from where we drove through the most northern Norway to Nordkapp – officially the most northern point of Europe. 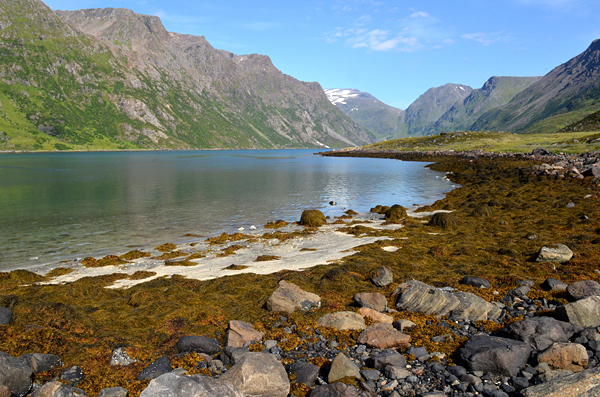 In fact the most northern point is located on the same island that Nordkapp, a few kilometers to the west, but traditionally Nordkapp is the famous one. 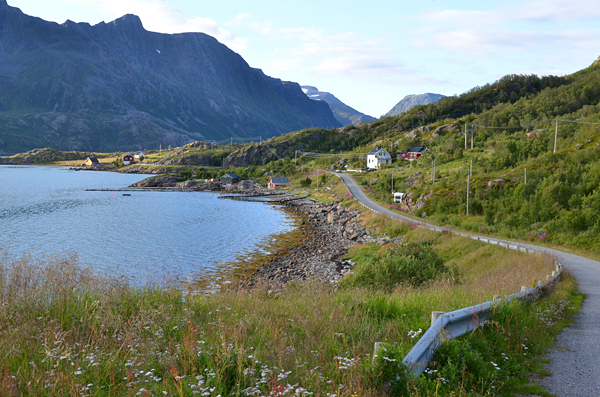 Drive to Nordkapp is amazing with diverse and beautiful landscapes. We stopped several times on the way admiring views and numerous reindeers which just love to spend time in the middle of the road. We had many opportunities to see closely these interesting animals. 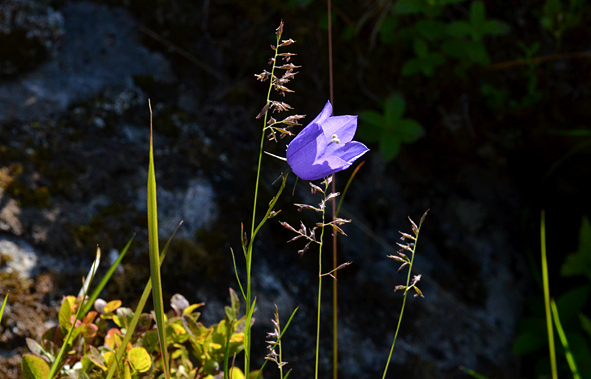 What is worth noticing it was so warm these days that they were trying to hide in the shadow – tunnel through the mountain was definitively a great place? 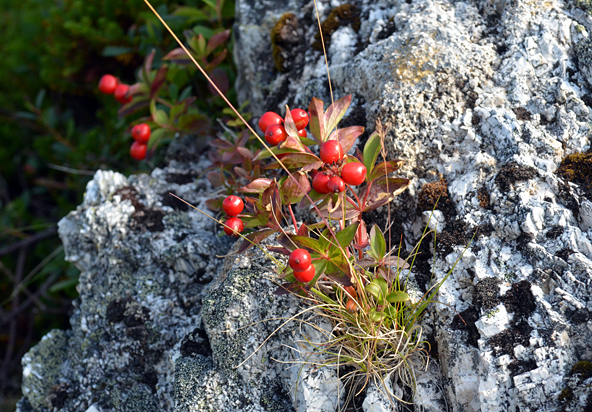 We visited also small town where reindeers walked on the streets and ate the grass from people`s gardens! 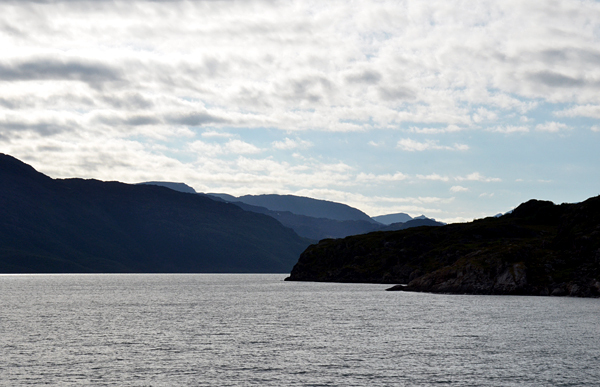 Nordkapp itself is located on the high cliffs, the famous sign – globe – is visible from a far distance. 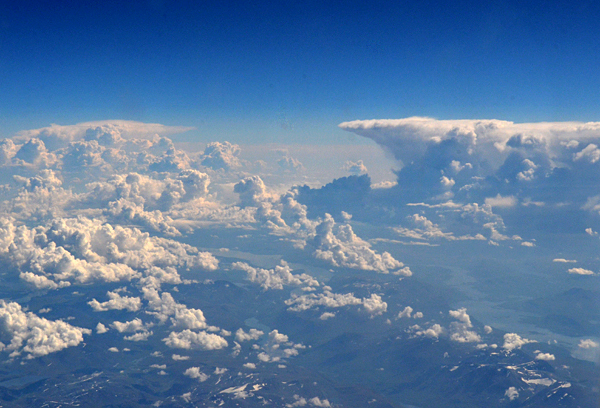 Views around are again spectacular and severe, even to the north where the sky connects with the endless sea. 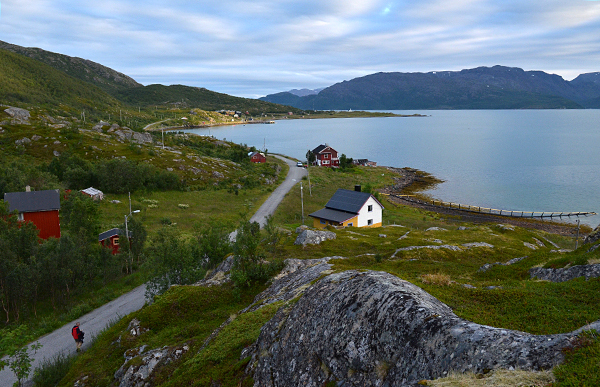 In the evening we drove back to Alta from where we flew to Oslo the next day. 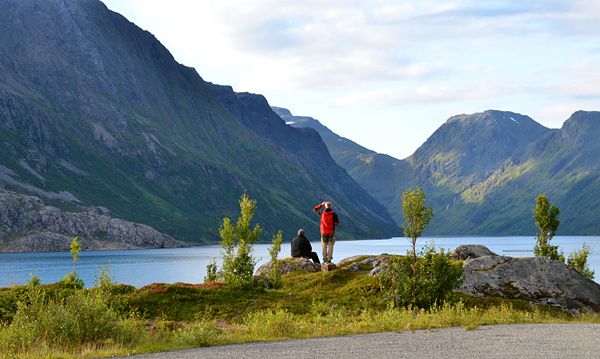 We split up with Erik at the airport in Oslo – he flew to Haugesund area where he lives, and set off to Warsaw. Definitively it was a great trip, in term of landscapes one of the truly incredible and inspiring, also great specimens and really fun time with a friend. Thank you for a great trip Erik – we will be back next year! Map of Europe showing our way to Alta thorugh Oslo; the marked area is shown in the next map. Google Maps. 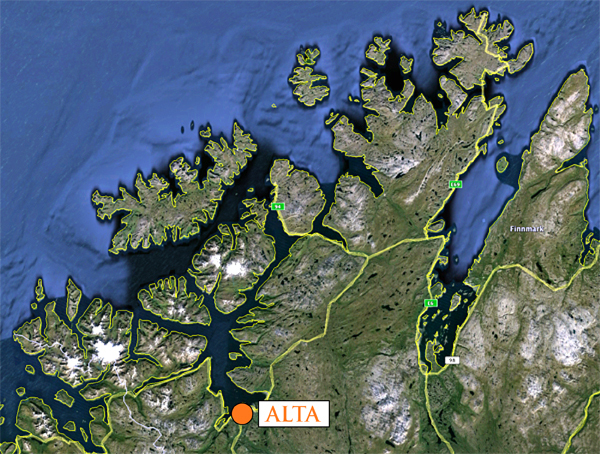 Map of part of northern Norway with Alta city. Google Maps. 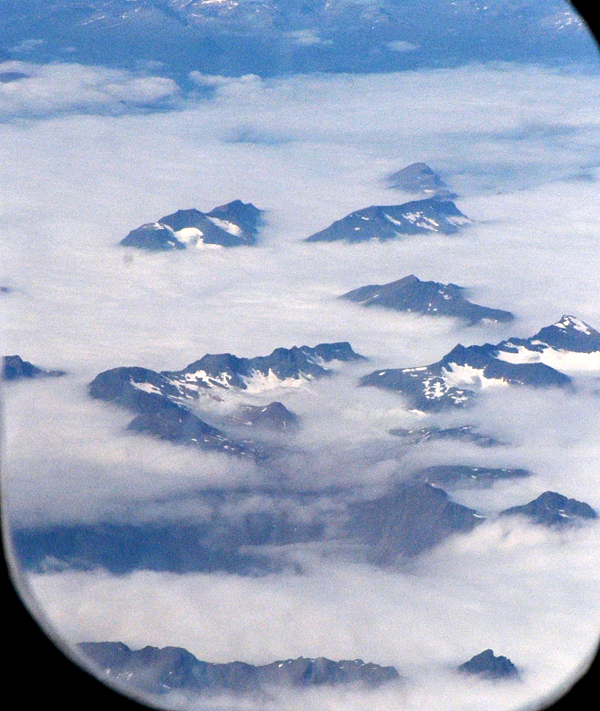 On the way to Alta, view from airplane window. J. Gajowniczek photo. 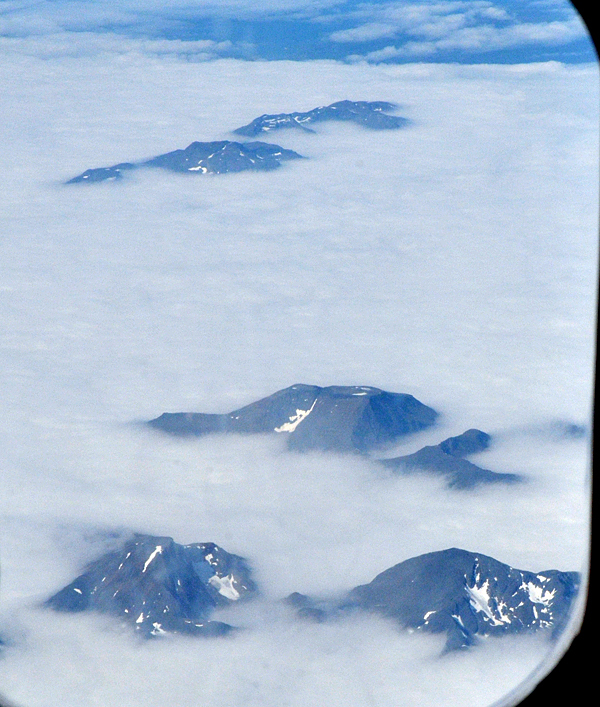 Landing in Alta. J. Gajowniczek photo. 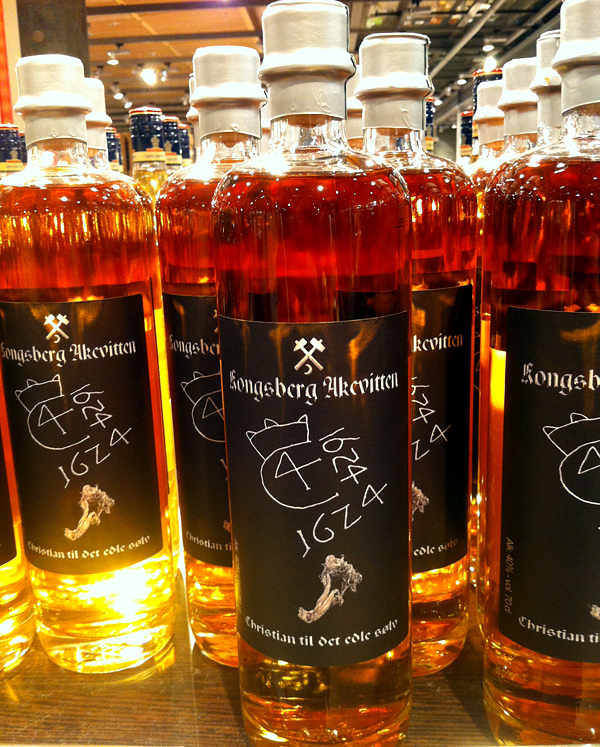 Liquer store at the airport, very interesting label and very high alcohol prices :) J. Gajowniczek photo. 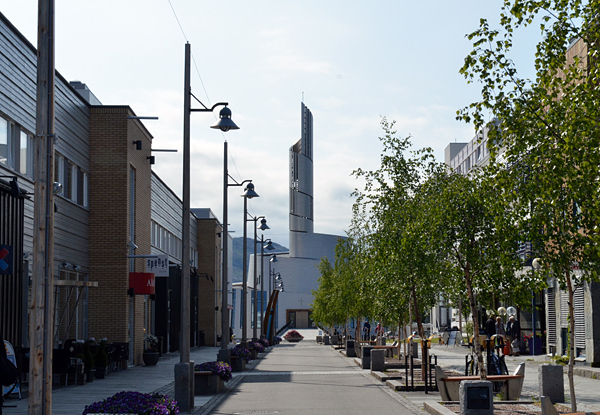 Center of Alta with a new church. J. Gajowniczek photo. 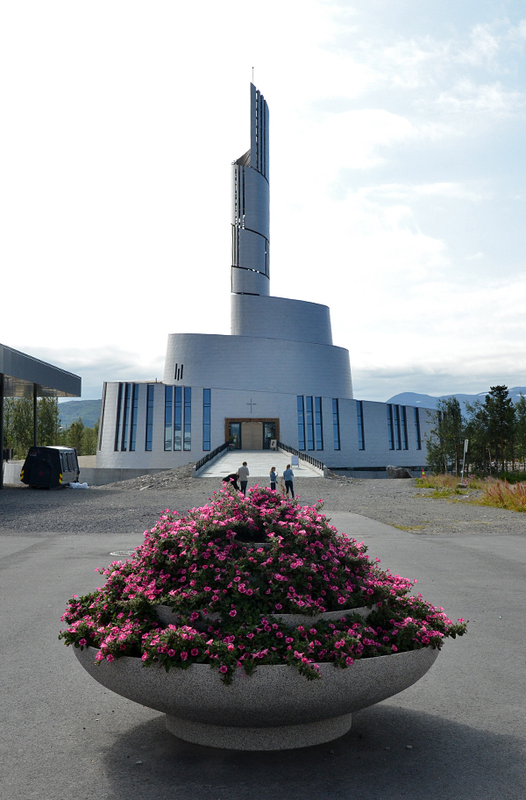 Church in Alta. J. Gajowniczek photo. 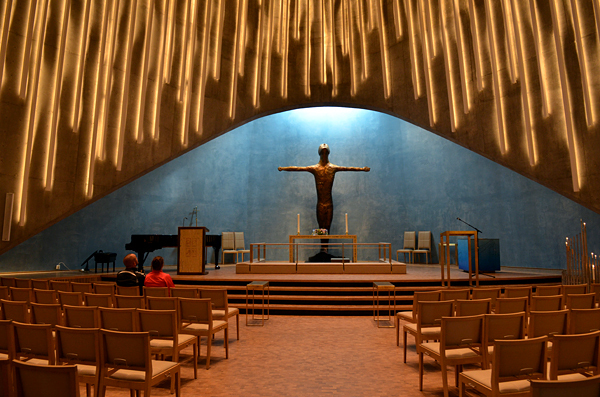 Inside of a very modern church. J. Gajowniczek photo. 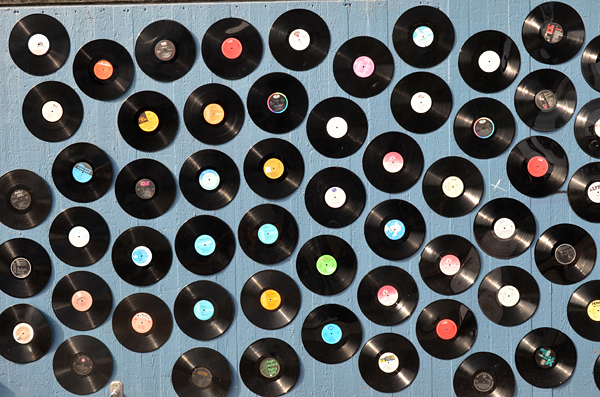 Wall of a building with a music store. J. Gajowniczek photo. 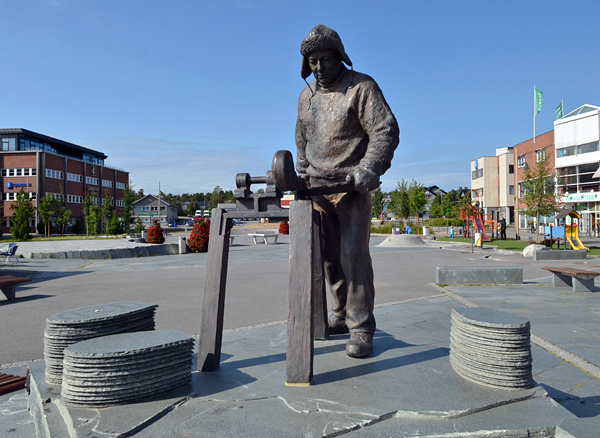 Alta was famous for schist used for constructions, monument on the street showing production. J. Gajowniczek photo. 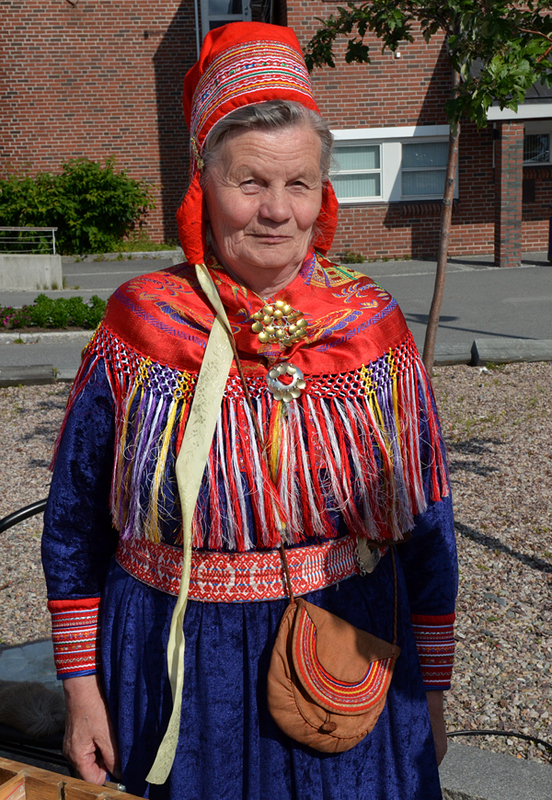 Woman in traditonal Sami clothing. J. Gajowniczek photo. 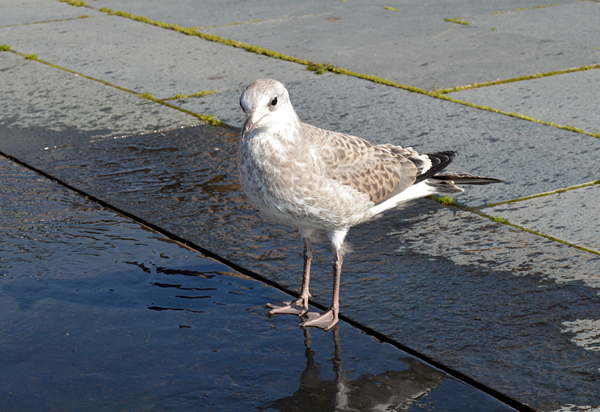 Bird on Alta street. J. Gajowniczek photo. 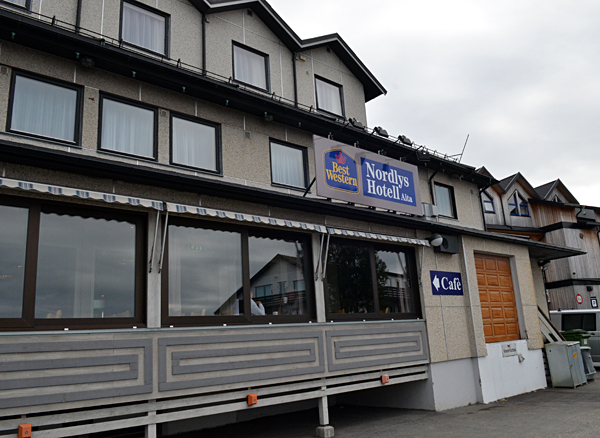 Why did we visit this hotel? J. Gajowniczek photo. 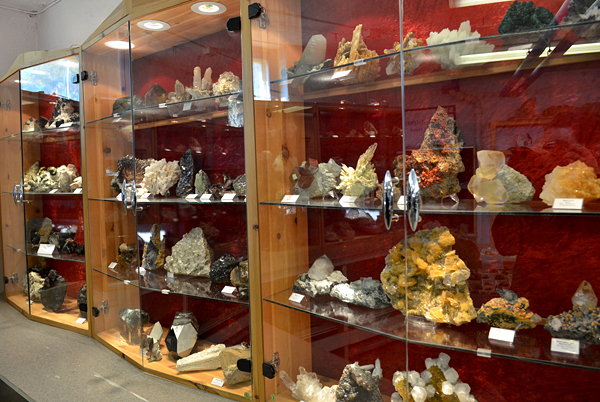 The answer is simple - inside there is a mineral collection as a part of decoration! J. Gajowniczek photo. 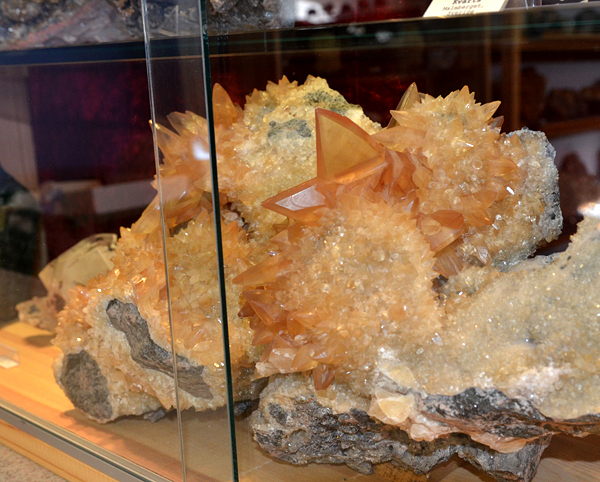 Big calcite from Malmberget (Sweden) on the exhibition. J. Gajowniczek photo. 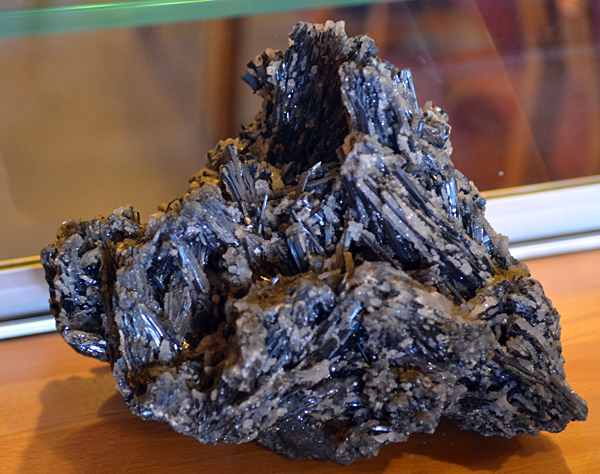 Stibnite from Norway on the exhibition. J. Gajowniczek photo. From Alta we drove to get a ferry in Storekorsen. J. Gajowniczek photo. On the way to the ferry. J. Gajowniczek photo. Eric and Tom waiting for the boat. J. Gajowniczek photo. 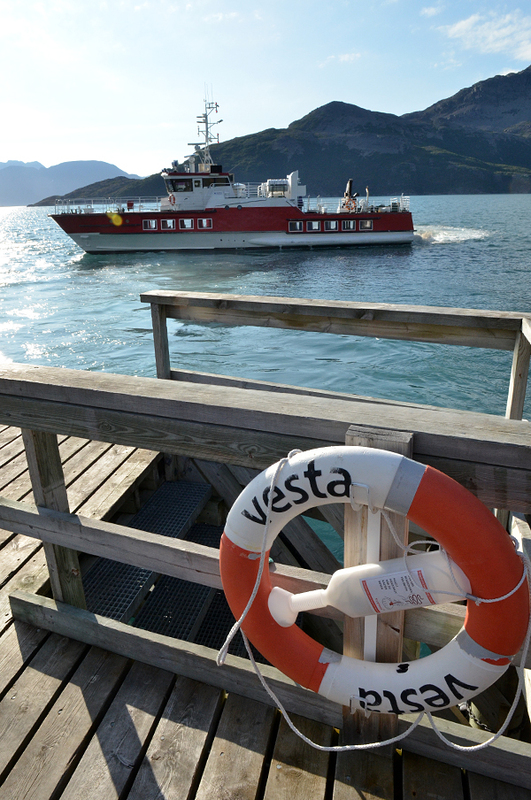 Ferry is coming, Seiland island visible in the background. J. Gajowniczek photo. Time to load! J. Gajowniczek photo. Leaving the mainland. J. Gajowniczek photo. Boat brought us to Altneset stoping in one harbor on the way. J. Gajowniczek photo. 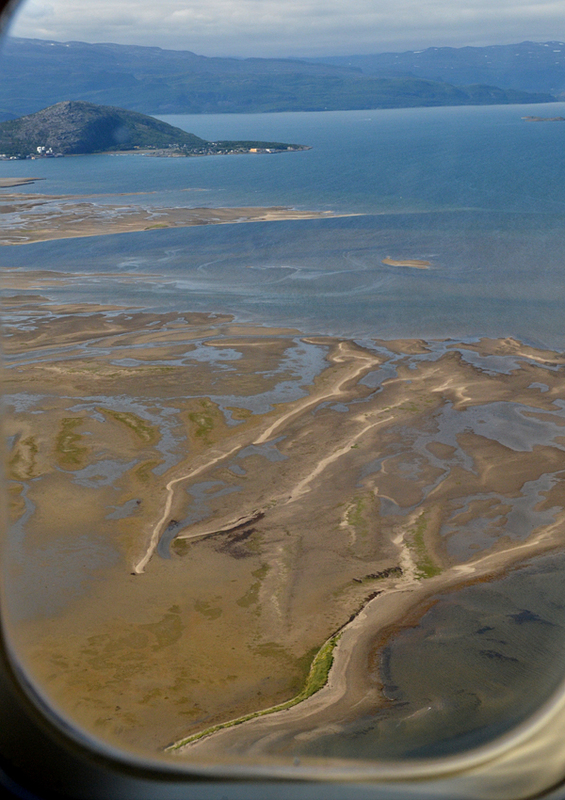 Going to Seiland. J. Gajowniczek photo. 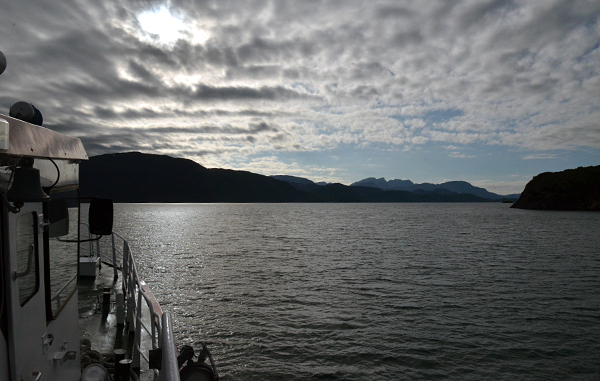 Spectacular views from the ferry. J. Gajowniczek photo. First closer view to Seiland. J. Gajowniczek photo. 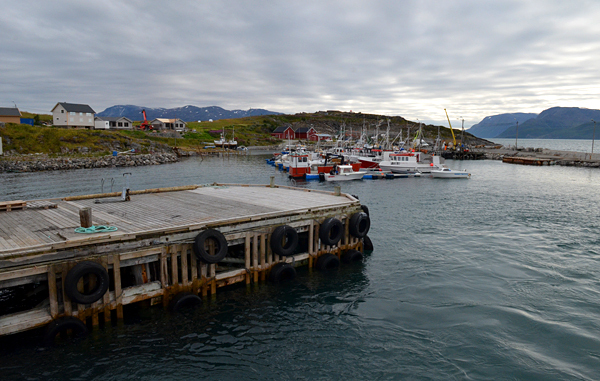 Small harbor - our first stop on Seiland. J. Gajowniczek photo. Going further to our destination. J. Gajowniczek photo. On the way to Seiland. J. Gajowniczek photo. 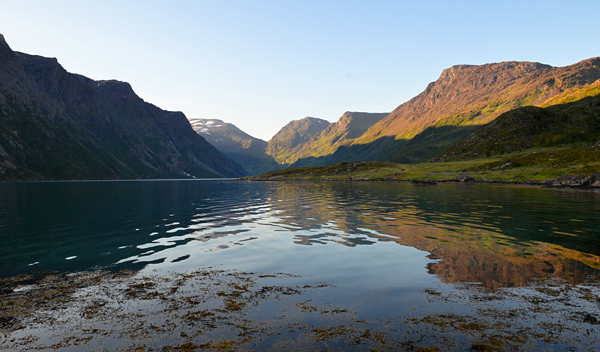 Here it is - "our fiord", harbor and village Altneset. J. Gajowniczek photo. 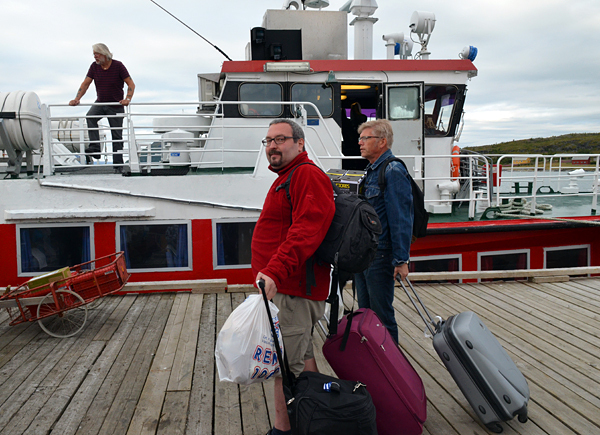 We are on the island, ferry is leaving. J. Gajowniczek photo. Ferry going back to the mainland. J. Gajowniczek photo. 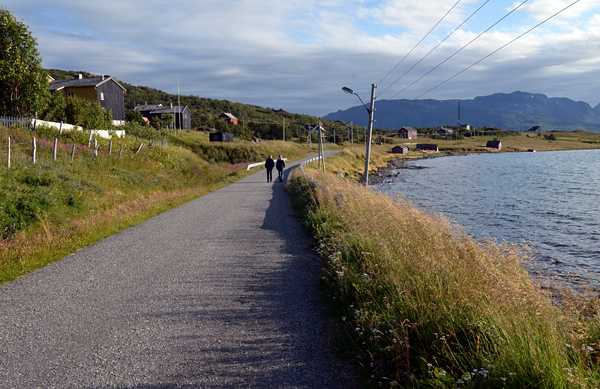 Walking the only road in southern part of island - only 7 km long. J. Gajowniczek photo. 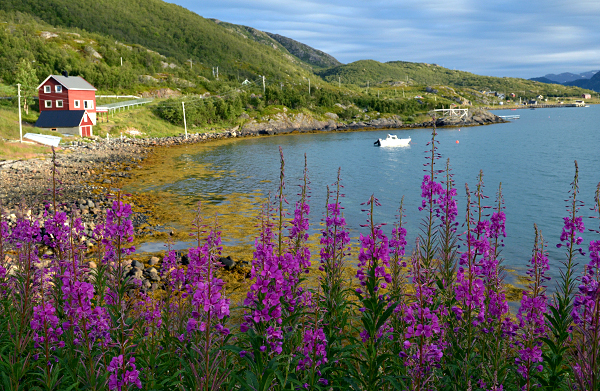 Beautiful coast. J. Gajowniczek photo. View from window of our house. J. Gajowniczek photo. And the most important reason why people visit Seiland. J. Gajowniczek photo. 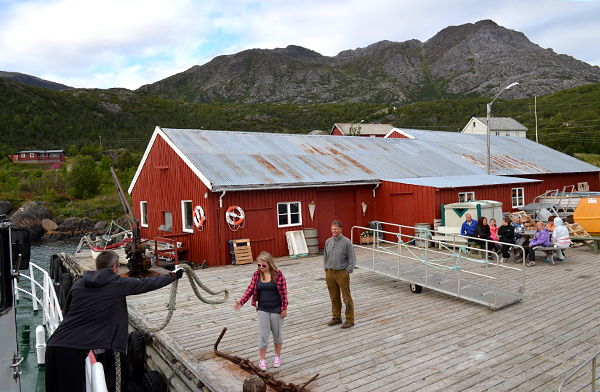 After ``checking-in`` we visited unusual local museum owned by a local collector - Gunnar, one of only 5 people leaving on island all year long! J. Gajowniczek photo. Inside the museum. Usually there are only a few visitors per year! What a pity! It is really worth seeing. J. Gajowniczek photo. Showcases with specimens. J. Gajowniczek photo. 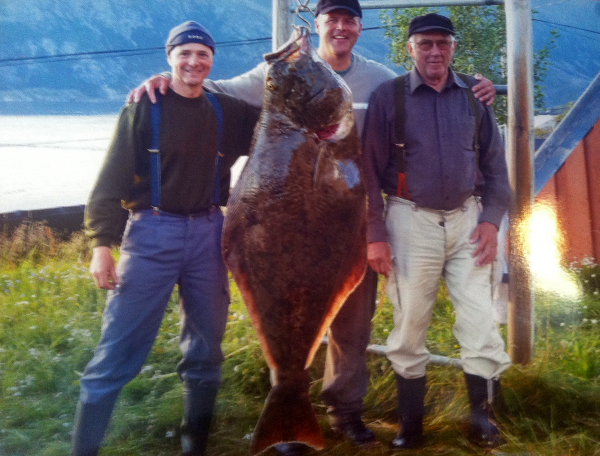 Huge specimen with "butterfly" twin from Malmberget, Sweden. J. Gajowniczek photo. 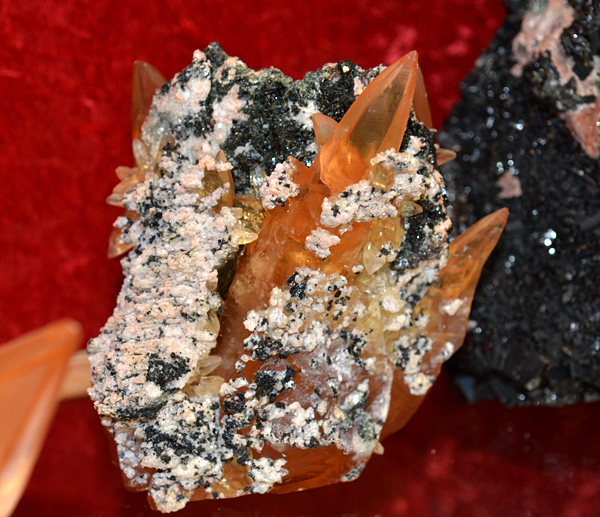 Another Malmberget calcite with incredible color. J. Gajowniczek photo. 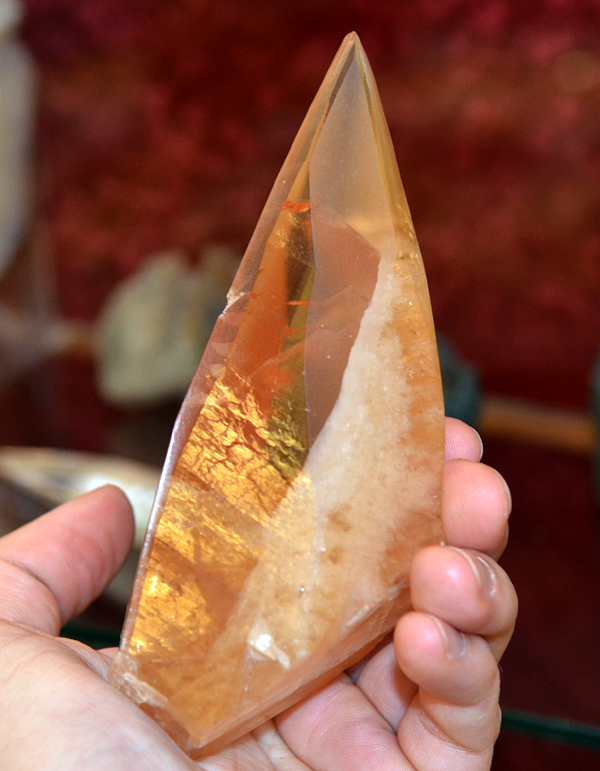 Big golden calcite crystal from Malmberget. J. Gajowniczek photo. 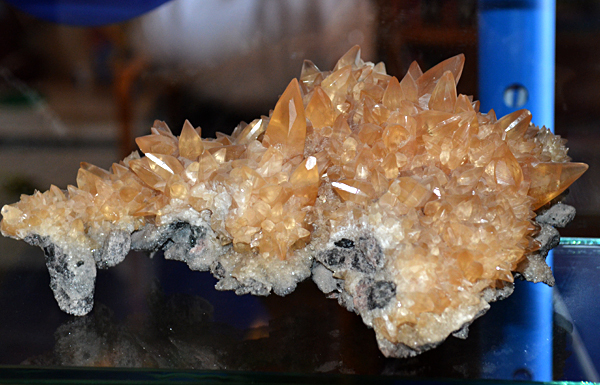 Different type of calcite from Malmberget. J. Gajowniczek photo. Two genereation calcite from Malmberget. J. Gajowniczek photo. 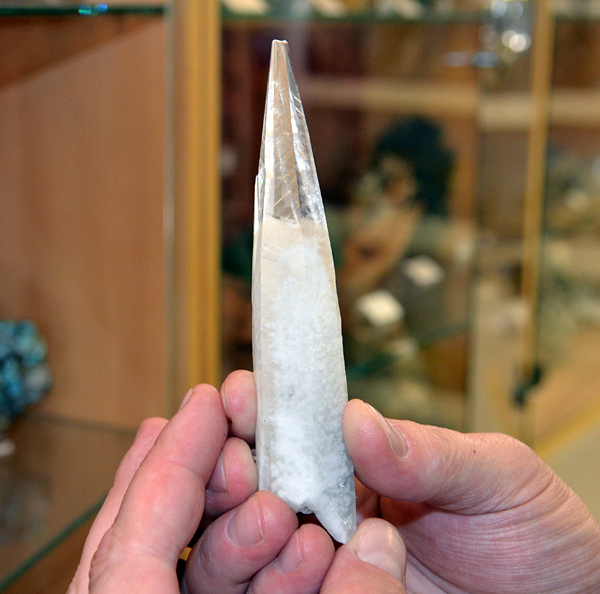 Big anatase crystal from Hyrdangervidda, Norway. J. Gajowniczek photo. 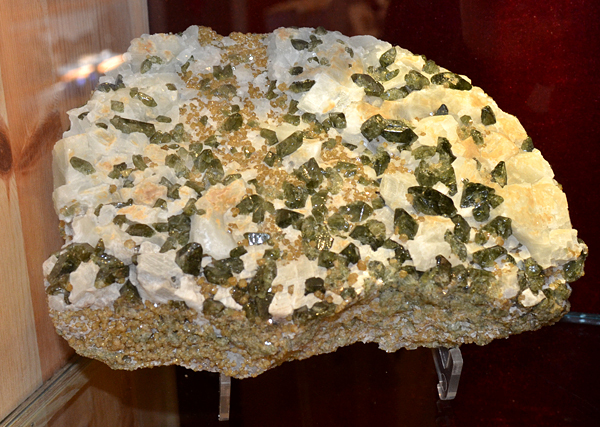 Of course in the museum there is a lot of local specimens - big diopside specimen from Seiland. J. Gajowniczek photo. 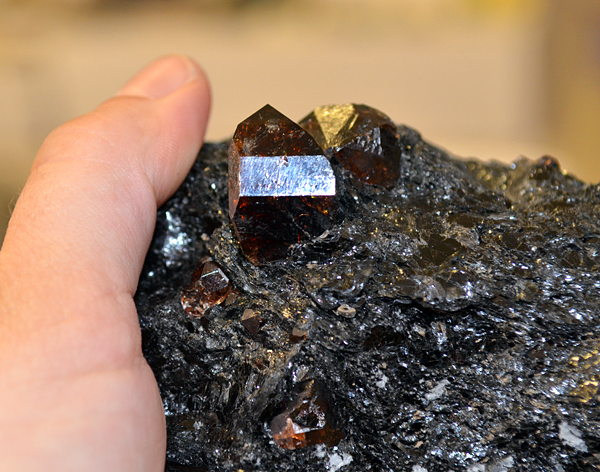 Finally - zircons from Seiland - one of the big specimens. J. Gajowniczek photo. 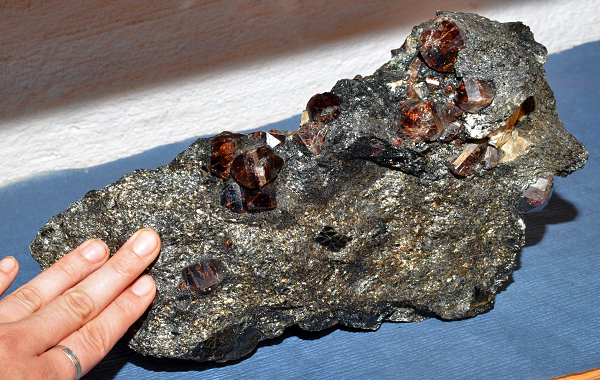 Big specimen with numerous zircon crystals. J. Gajowniczek photo. Another great zircon specimen. J. Gajowniczek photo. Sharp, gemmy zircon crystals. J. Gajowniczek photo. 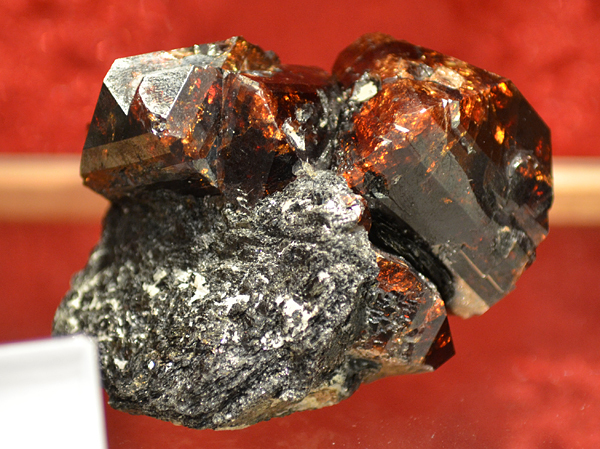 Another zircon specimen from the museum. J. Gajowniczek photo. 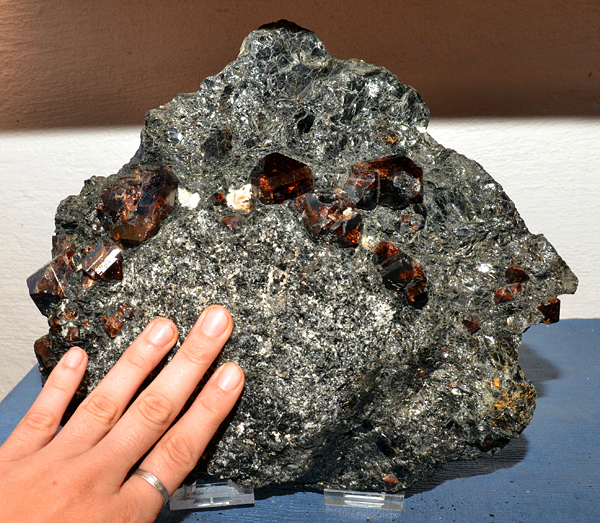 Shelf with huge zircon crystals. J. Gajowniczek photo. 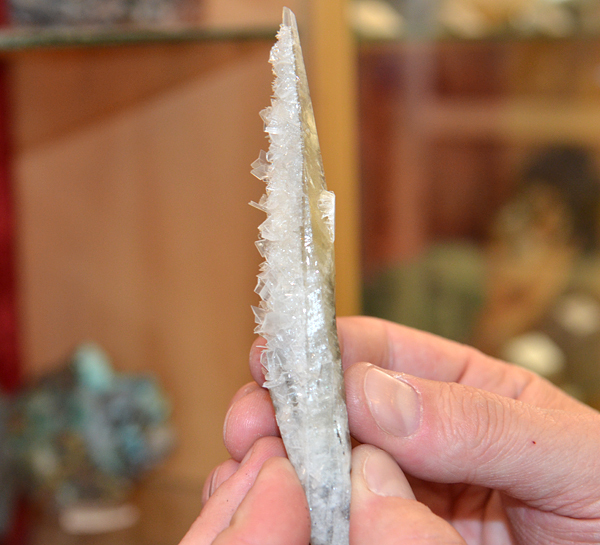 Probably the biggest crystal in the museum, about 7 cm high. J. Gajowniczek photo. Group of zircons crystals up to about 5 cm. J. Gajowniczek photo. 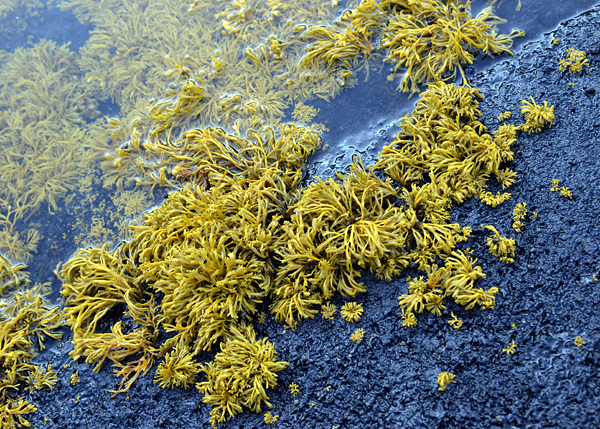 Close-up of the same specimen. J. Gajowniczek photo. 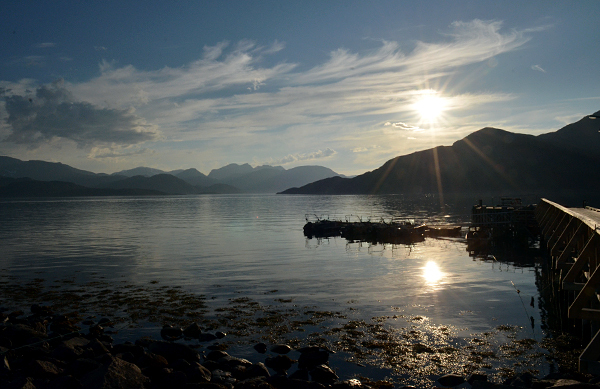 In summer sun is visible on the sky 24h long, so in the night we took a walk to see the island. J. Gajowniczek photo. 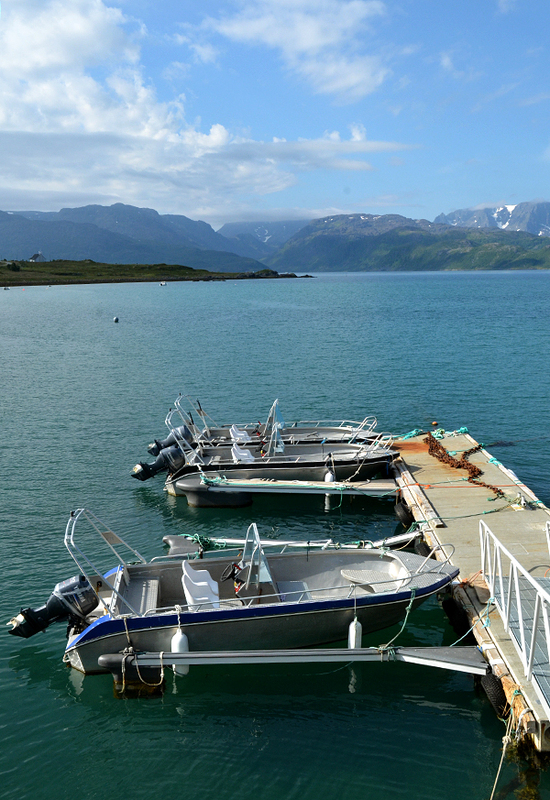 Small harbor. J. Gajowniczek photo. Walking through Seiland island. J. Gajowniczek photo. 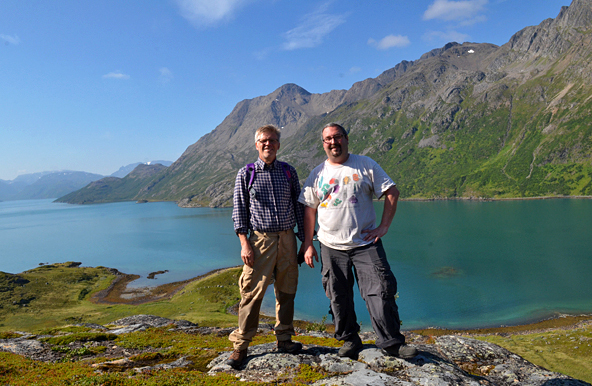 Tom and Erik planning next day trip to the zircon locality. J. Gajowniczek photo. 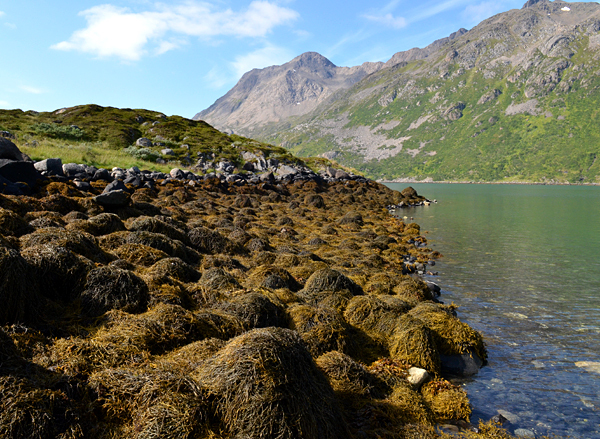 Mushrooms are everywere in Seiland, local people do not pick them - luckily for us. J. Gajowniczek photo. 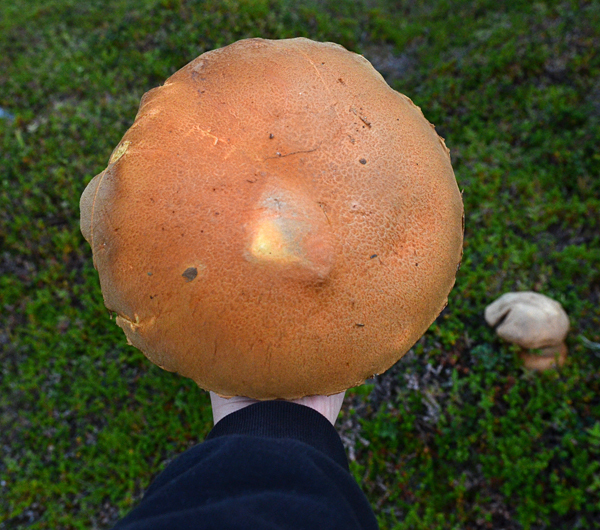 Big mushroom. J. Gajowniczek photo. A lot of mushrooms :-) J. Gajowniczek photo. Dinner is comming. J. Gajowniczek photo. Almost ready! Do you feel the smell? J. Gajowniczek photo. Next day the weather was great again. J. Gajowniczek photo. Asia ready to go for zircons! We expected low temperature and strong wind on the top. T. Praszkier photo. Waiting for the boat. J. Gajowniczek photo. 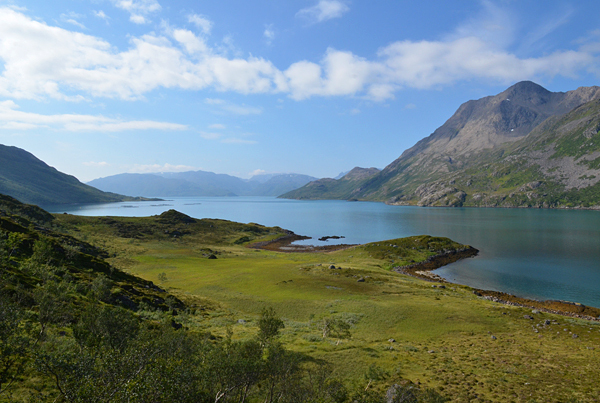 Panoramic shot of the fiord. J. Gajowniczek photo. Boats waiting for us, only the driver is missing :-) J. Gajowniczek photo. 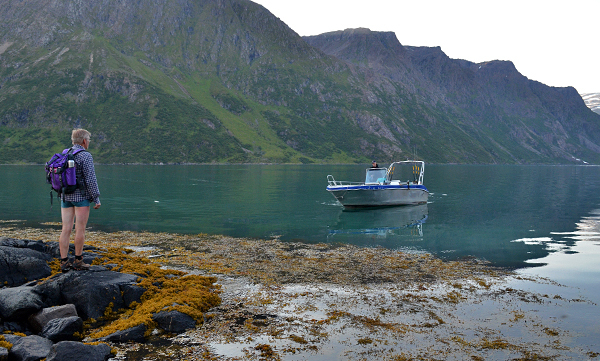 Finally we took a boat from Altneset to the fiord shore from where we climbed about 800 meters up. J. Gajowniczek photo. Going by boat. J. Gajowniczek photo. 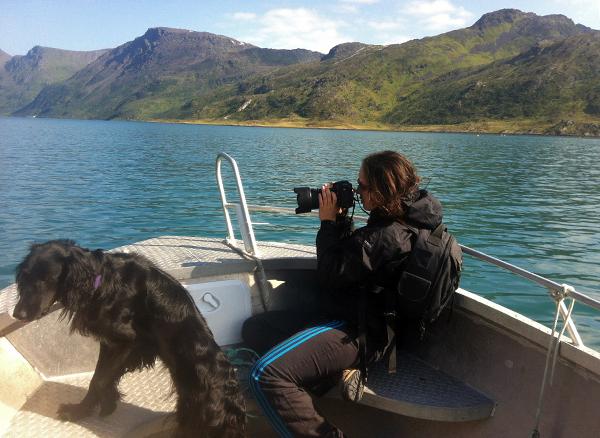 Asia and "sea dog". J. Gajowniczek photo. 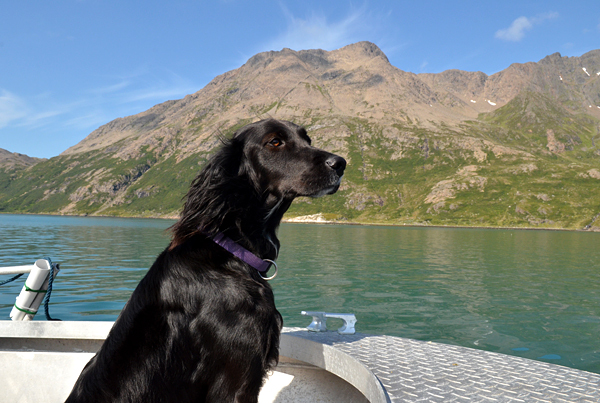 Dog on the boat. J. Gajowniczek photo. 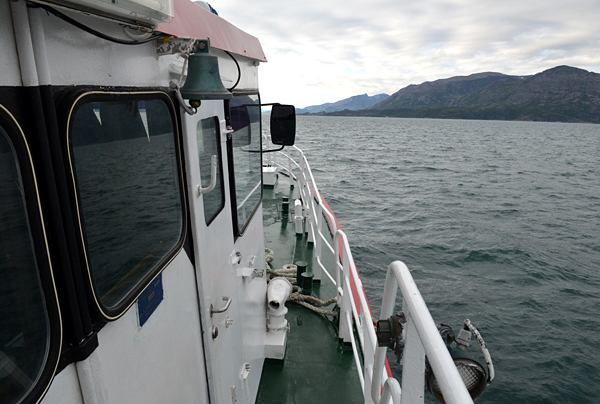 We are going into the fiord. J. Gajowniczek photo. 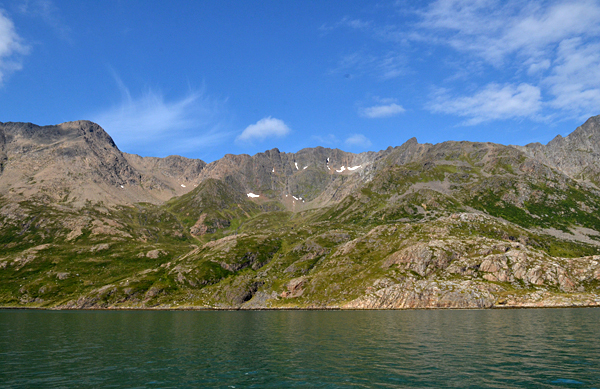 End of the fiord, black dot is a big eagle. J. Gajowniczek photo. 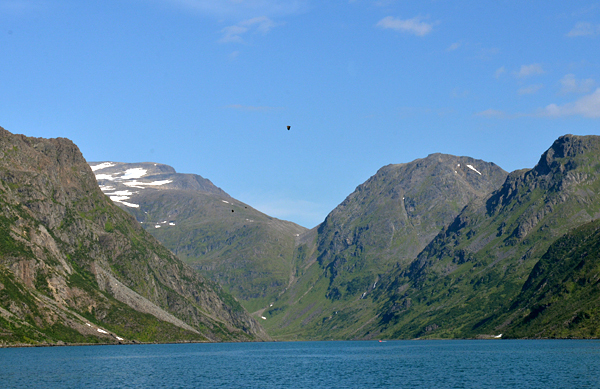 Mountains around fiord. J. Gajowniczek photo. 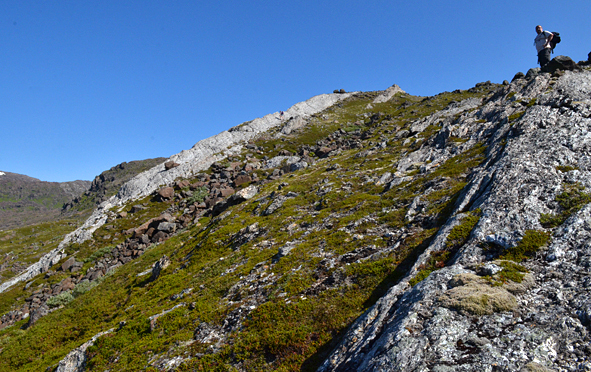 First view to the syenite veins - white lines going uphill. J. Gajowniczek photo. White syenite veins are very well visible. J. Gajowniczek photo. 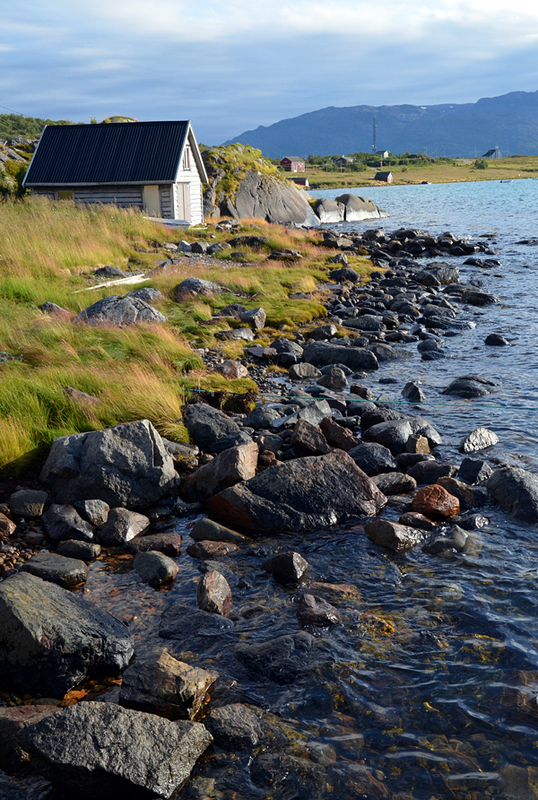 On the shore. J. Gajowniczek photo. Boat is leaving ... J. Gajowniczek photo. ...and first we go to the syenite veins. J. Gajowniczek photo. Going to the syenite vein. J. Gajowniczek photo. 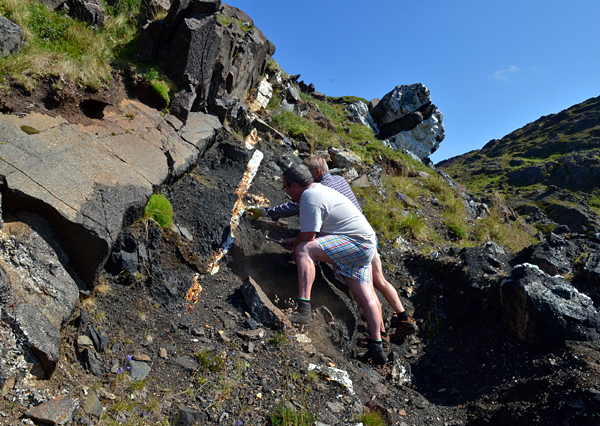 Tom and Erik examining the syenite vein. J. Gajowniczek photo. 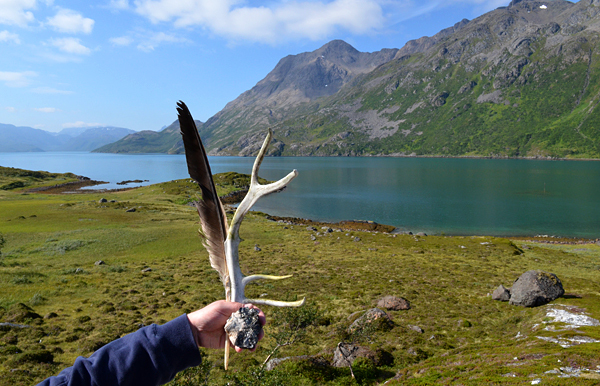 Collection is growing - reindeer`s horns, eagle`s feather and magnetite :-) J. Gajowniczek photo. When we go up view starts to get wider and wider. J. Gajowniczek photo. Climbing on steep hill without any trail. J. Gajowniczek photo. Erik and Tom on the way up. J. Gajowniczek photo. Syenite veins are visible everywhere. J. Gajowniczek photo. Examining syenite pegmatite. J. Gajowniczek photo. 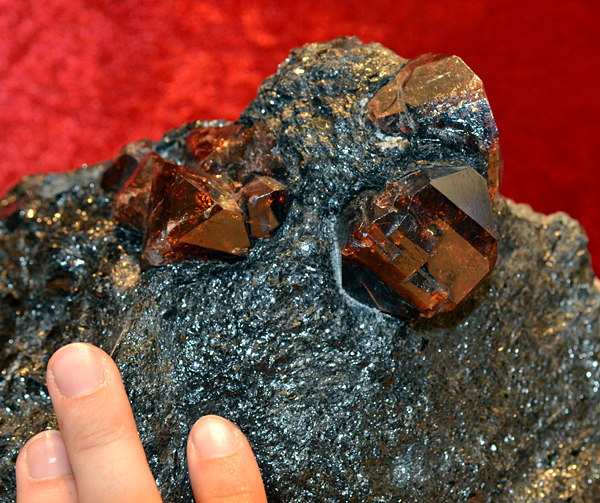 Big magnetite crystals. J. Gajowniczek photo. 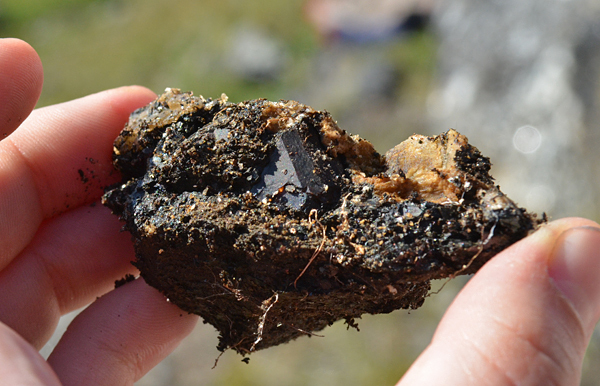 Big magnetite crystal in syenite. J. Gajowniczek photo. 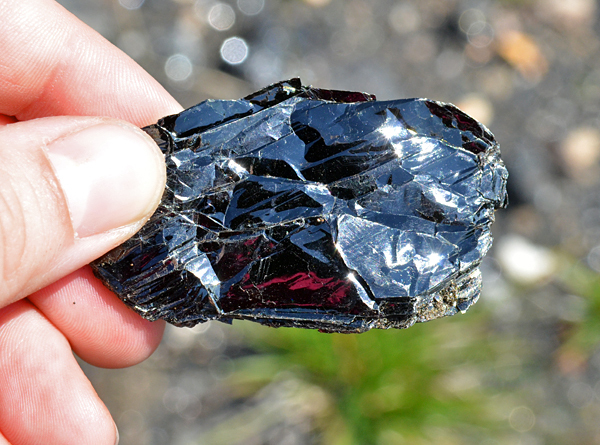 Biotite crystal. J. Gajowniczek photo. 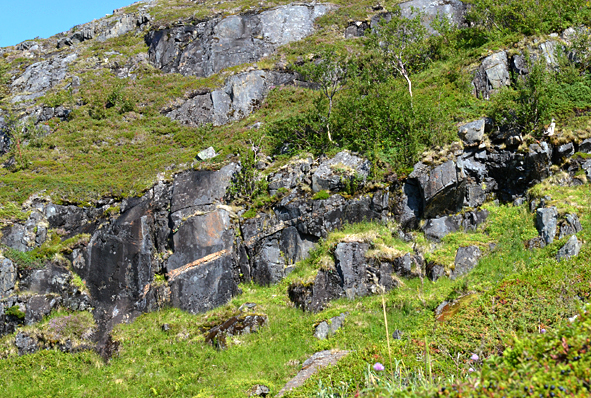 Tom on the pegmatite vein. J. Gajowniczek photo. Pegmatite veins. J. Gajowniczek photo. 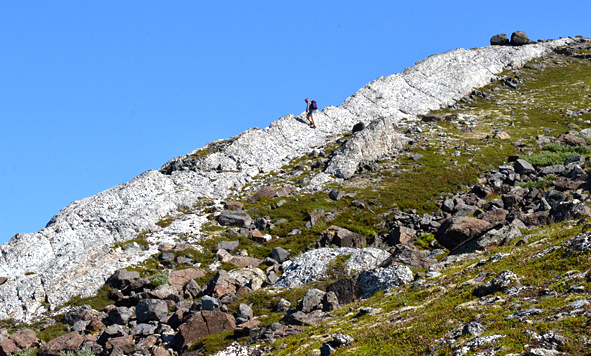 Erik on another pegmatite vein. J. Gajowniczek photo. Asia taking photos. T. Praszkier photo. We are higher and higher. J. Gajowniczek photo. View is really breathtaking. J. Gajowniczek photo. 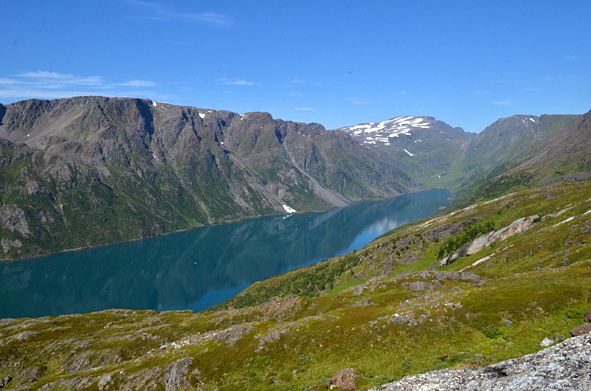 Panoramic view to the fiord. J. Gajowniczek photo. Tom resting on the way up. J. Gajowniczek photo. 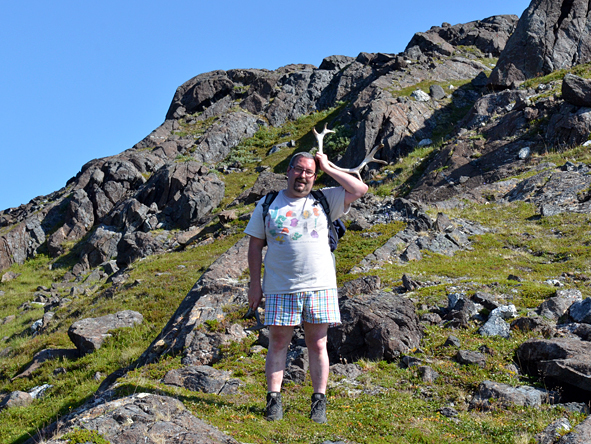 It was so hot that we packed all clothes and walked in underwear :-) Who would expect that 400 km north from the Polar Circle? J. Gajowniczek photo. 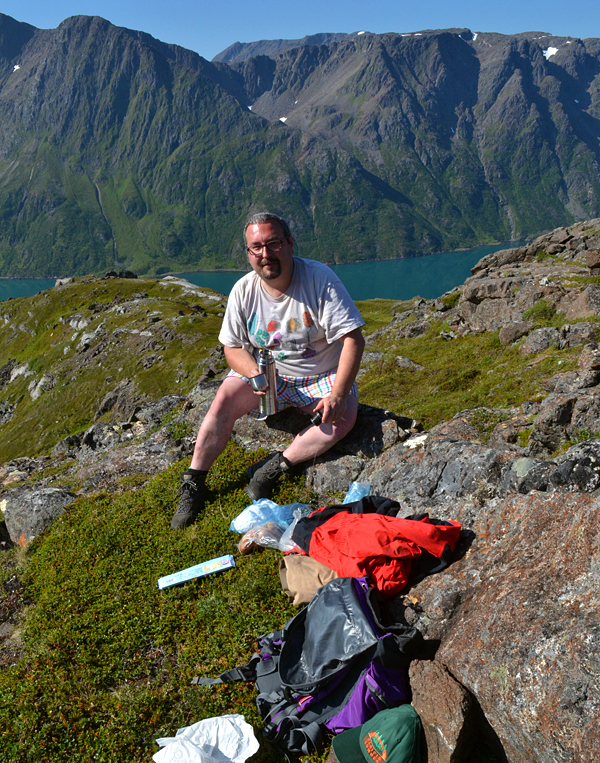 Finally we are on the top, workings in the biotite lens are visible in the right corner of photo. J. Gajowniczek photo. 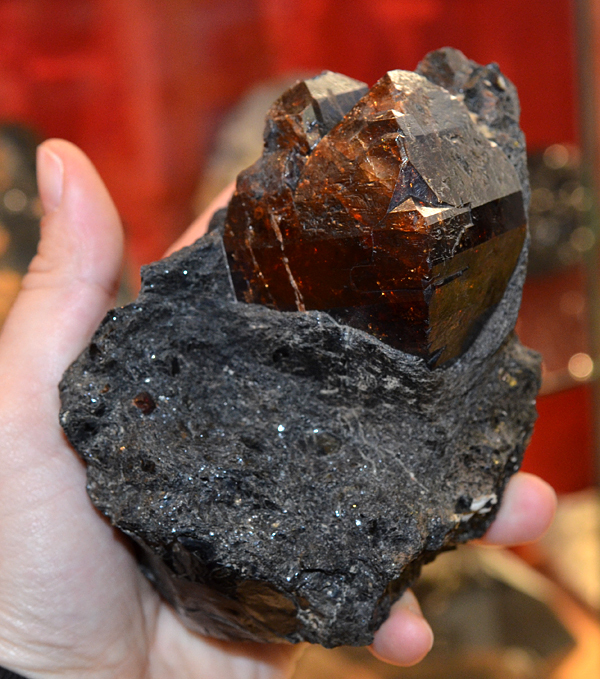 Big biotite crystals. J. Gajowniczek photo. 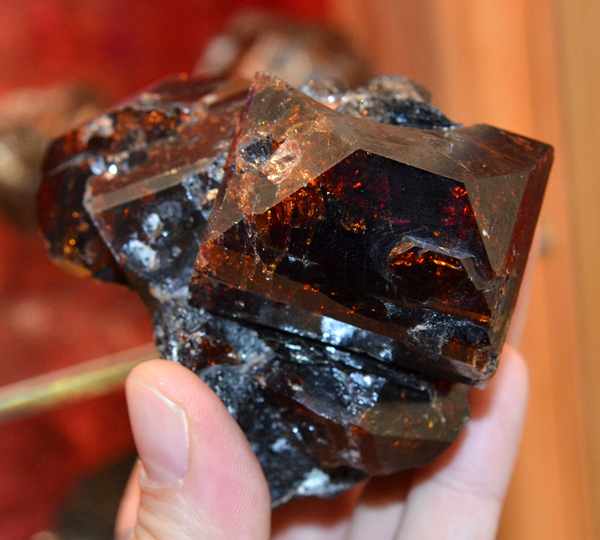 Big biotite crystal. J. Gajowniczek photo. 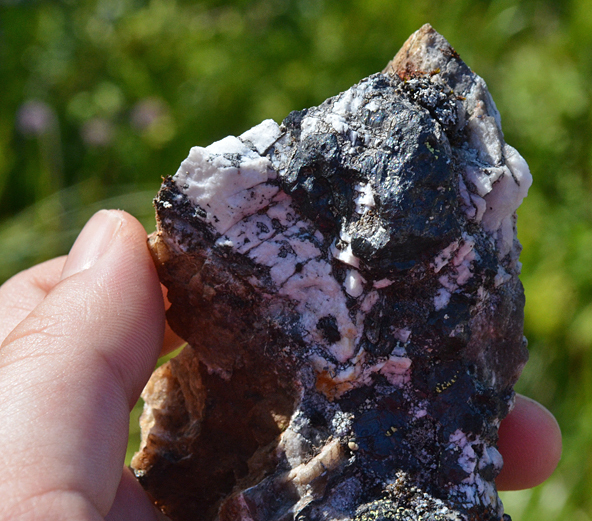 Well formed biotite crystal in pegmatite. J. Gajowniczek photo. 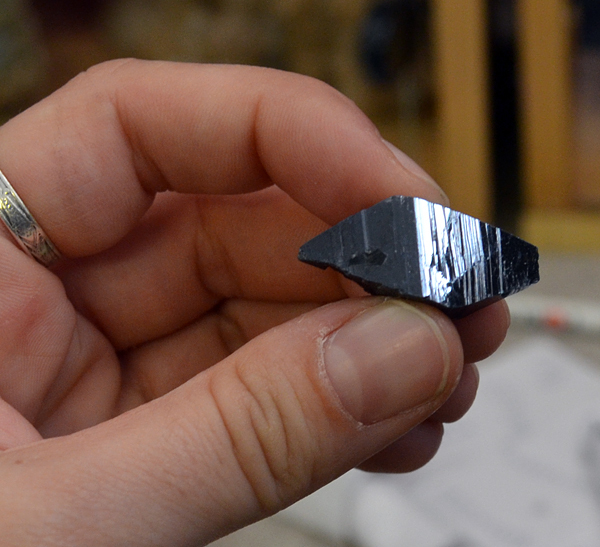 Well formed biotite crystal. J. Gajowniczek photo. 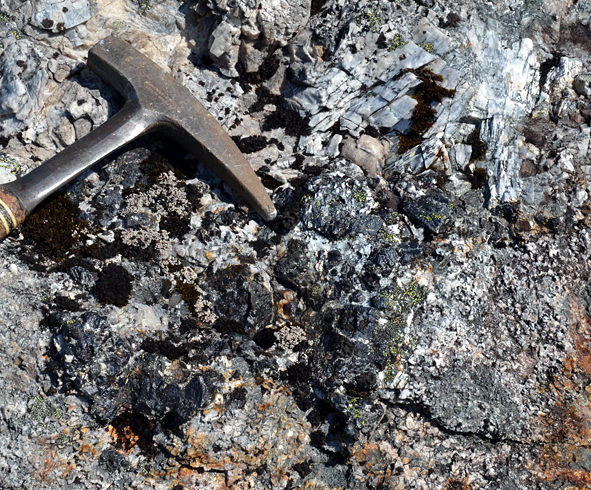 Erik with syenite cut by biotite vein. J. Gajowniczek photo. Biotite lens where zircons occur. J. Gajowniczek photo. 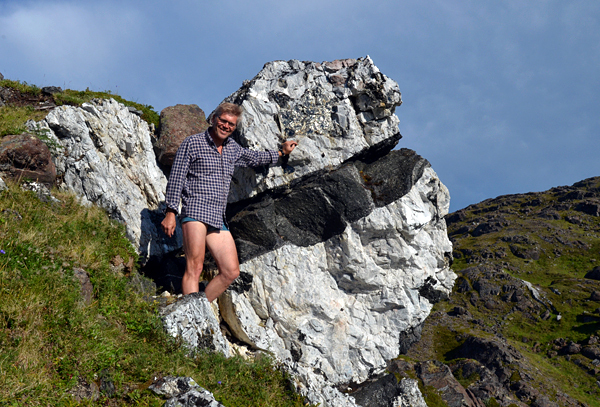 Collecting in underwear started :-) J. Gajowniczek photo. 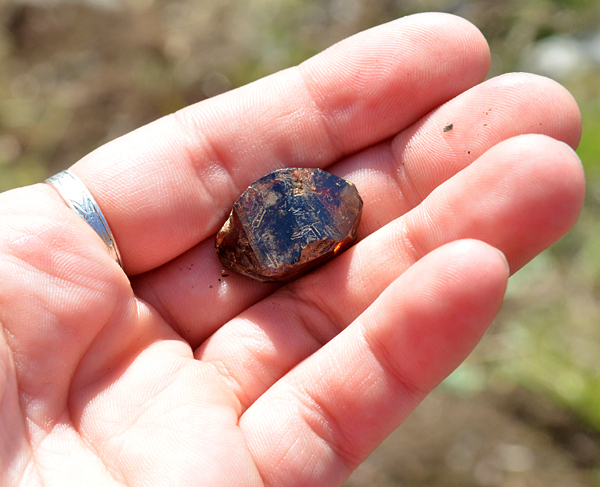 After some diggings we found zone with zircon crystals. J. Gajowniczek photo. 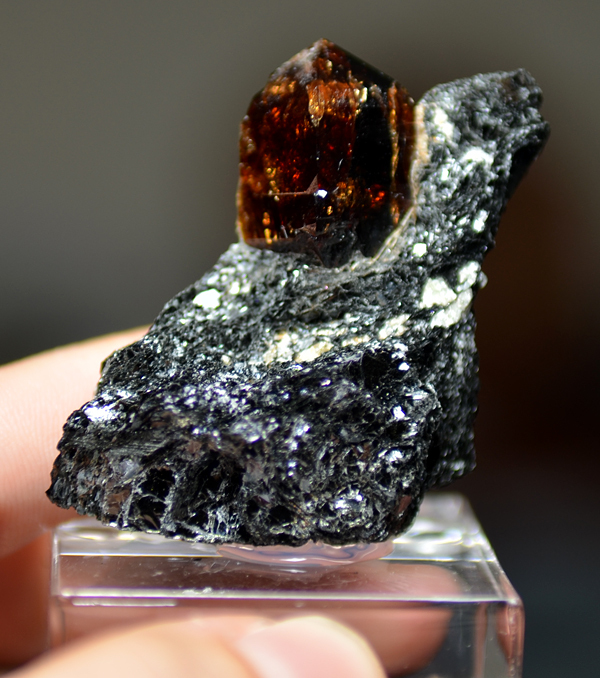 Fragment of the zircon-rich biotite. J. Gajowniczek photo. Good quality zircon crystal showed up. J. Gajowniczek photo. 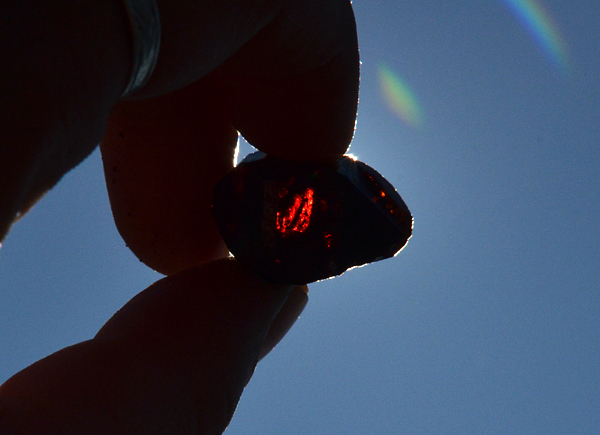 Gemmy and lustrous zircon crystal in situ. J. Gajowniczek photo. And this is how it looks like after lab work. J. Gajowniczek photo. It showed up to be very gemmy too! J. Gajowniczek photo. Another zircon specimen. J. Gajowniczek photo. More zircons. J. Gajowniczek photo. 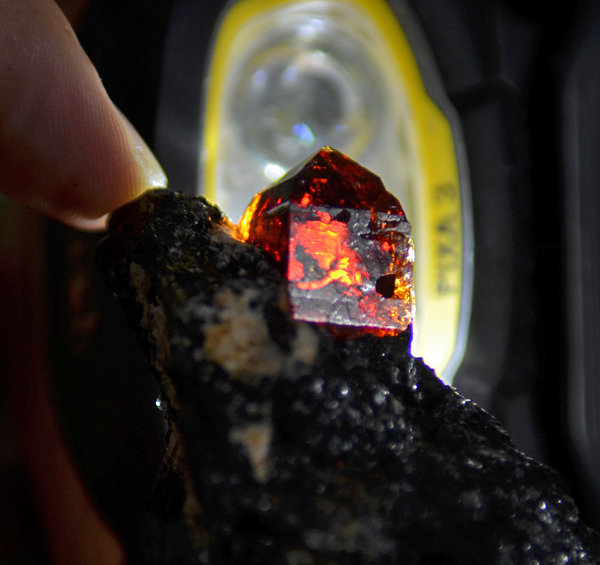 Doubly terminated zircon crystal. J. Gajowniczek photo. Gemmy one. J. Gajowniczek photo. 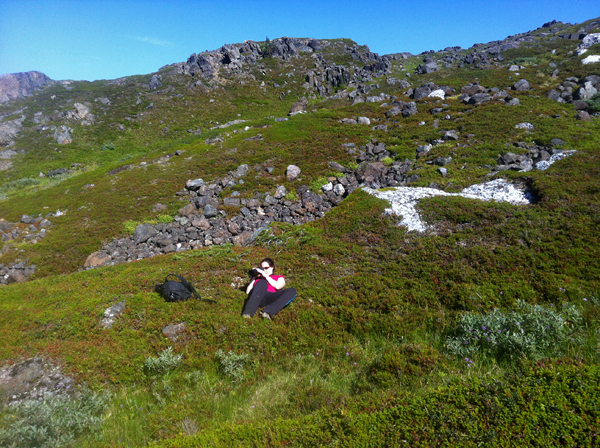 Finally we packed specimens which we collected that succesful day. J. Gajowniczek photo. Tom resting after hours of digging. J. Gajowniczek photo. 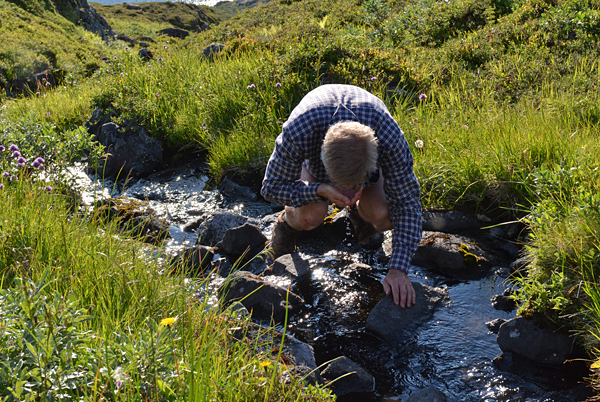 Fresh water from the stream. J. Gajowniczek photo. We went to see view to the plateau. J. Gajowniczek photo. 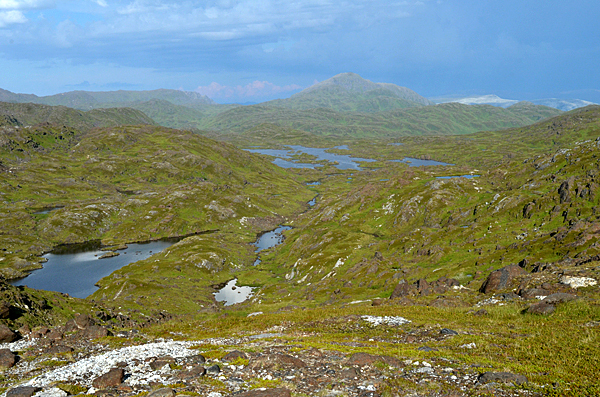 View to the plateau with numerous post-glacial lakes. J. Gajowniczek photo. Time to go down, sun is still there! J. Gajowniczek photo. Going down. J. Gajowniczek photo. Last view to the syenite veins. We will be back! J. Gajowniczek photo. Finally back to the coast and waiting for the boat. J. Gajowniczek photo. 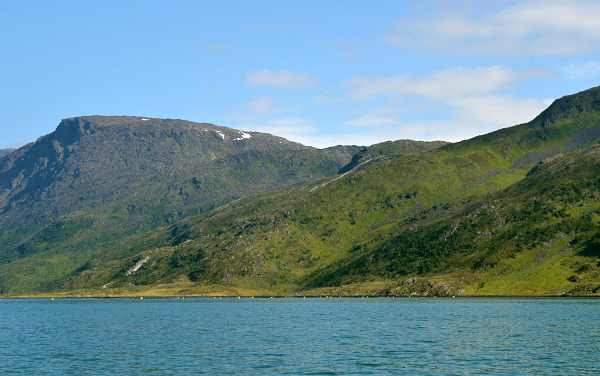 View to the fiord. J. Gajowniczek photo. Underwater life. J. Gajowniczek photo. Believe me - it is very slippery. J. Gajowniczek photo. Finally the boat is here. J. Gajowniczek photo. On the way back to our cottage. J. Gajowniczek photo. We are back. Is that sunset on sunrise? J. Gajowniczek photo. Time to go to sleep afer a very long day. J. Gajowniczek photo. This was a realy great trip! With friends, minerals, great weather, Krupnik and mushrooms. Could not be better. Thanks again Tom and Asia for a great trip. And of cause: A great report! FANTASTIC! Such great travelogues. Minerals and Mushrooms- wow (but NEVER eat shrooms yr unfamiliar with- those look like delicious boletes). Give me those Zircons! And nice underwear Tom. So the zircons are enclosed in the biotite ? There are no pockets ? 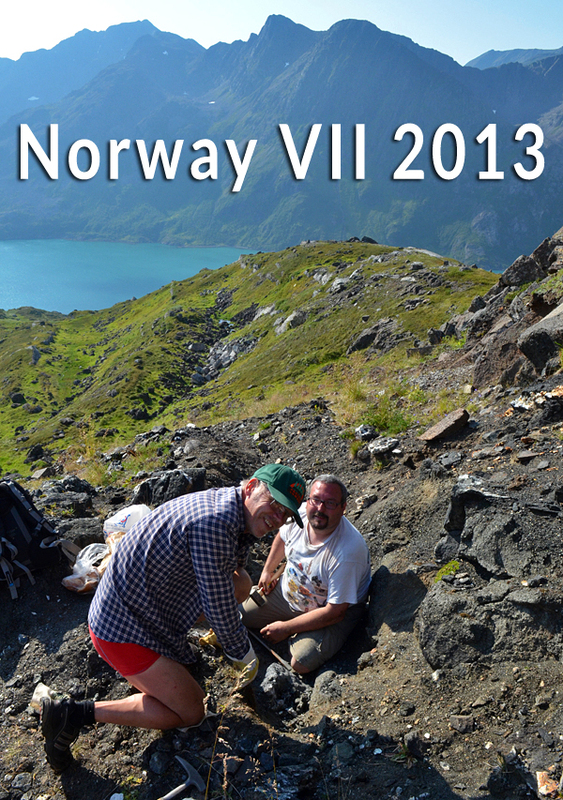 Very nice report and amazing place to collect. I would have loved to see even more pictures of your findings !